South of W. Renner Road and west of Custer Pkwy. 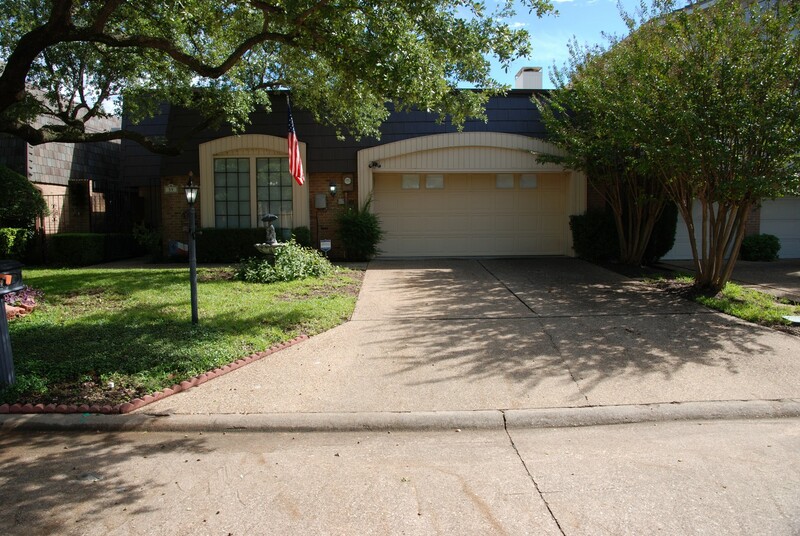 This week we have a wonderful sale in the Canyon Creek Country Club area of Richardson. 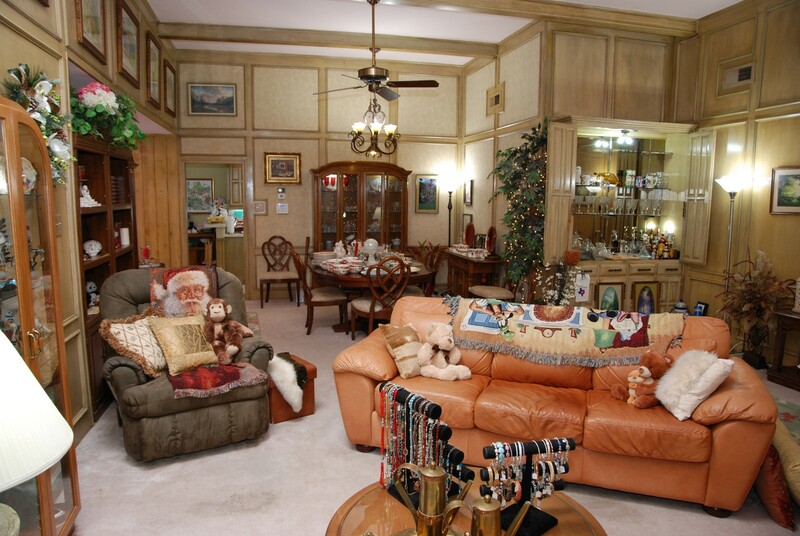 The home is packed full of interesting brand name collectables that were well cared for by the family. 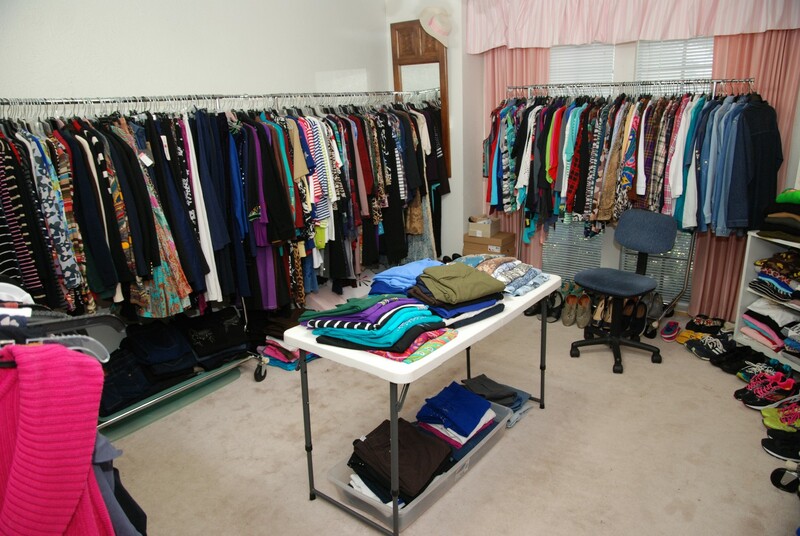 Included among them are Cambridge, Rose Point, and designer sterling by Judith Ripka & Barbara Bixby (bracelets, earrings, necklaces, and rings), Designer Clothing (sizes Med –XL), Jim Shore, Mikasa, Noritake, Perfumes, Spode, Electronics, a Sony Bravia TV, Dallas Cowboys, Thomasville, Waterford Crystal and UGGS (new). 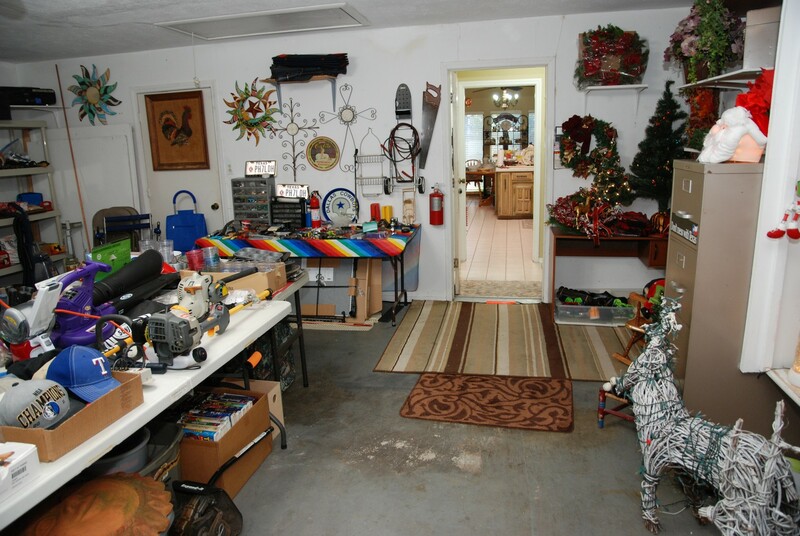 There is a huge assortment, and all the rooms are packed with lots of interesting goodies. There is limited parking so come early and please do not block neighborhood mail boxes. Thank you! We will limit the number of people in the house and will distribute sequential numbers to those who are waiting to enter. We will use the same numbers for serving order in the jewelry area located at check-out. Thanks for your patience! 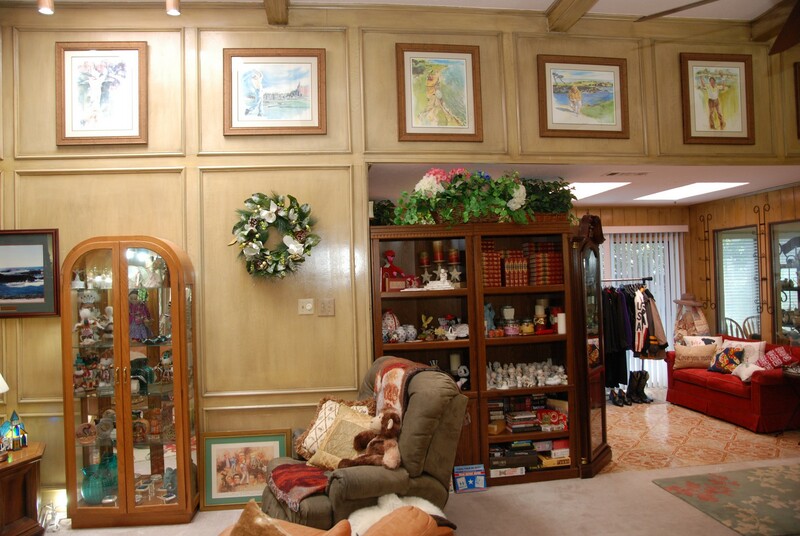 Entry / Living Room / Bar / Checkout Area – features a painting of an elephant by Limj Lynn. The bar features vintage Cambridge Rose Point. We have wine and water glasses (8 each), a round platter, a rectangle platter with handles, eight desert plates, a liquor bottle, a small bowl with saucer, three different style pitchers, and a desert plate with center handle. All are free of chips. 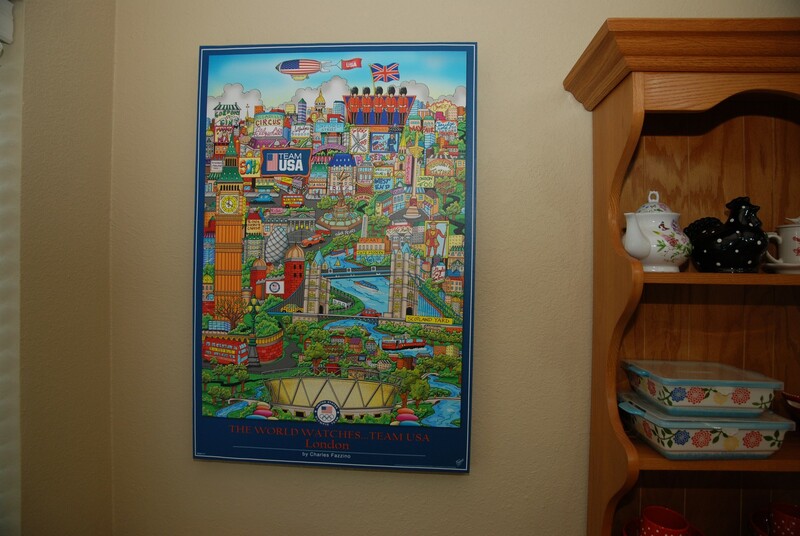 There is a nicely framed large “Flower Shop” by G. Harvey and a nicely framed Wall Street – Canyon of Dreams by G. Harvey. 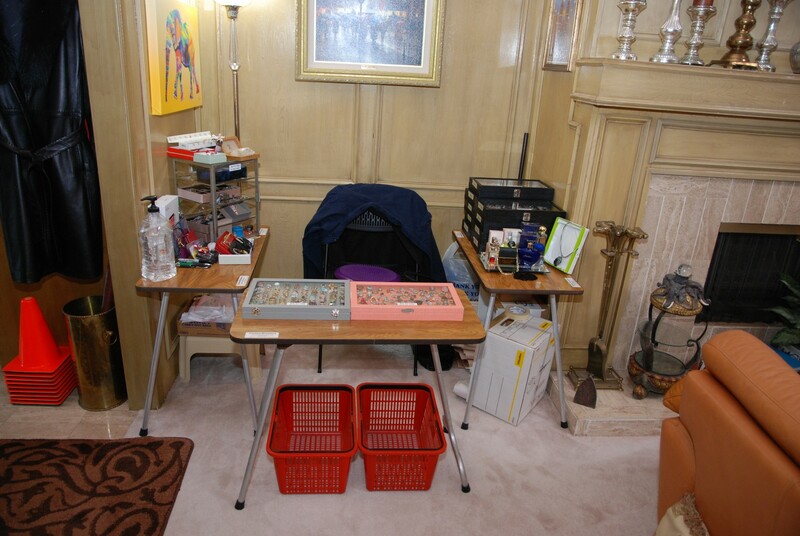 We have eleven containers of sterling silver jewelry - some by Judith Ripka and some by Barbara Bixby. There is a lot more unsigned with .925 markings. There is a great set of brass fireplace tools and a double tray / desert server adorned with elephants that would make a great centerpiece. 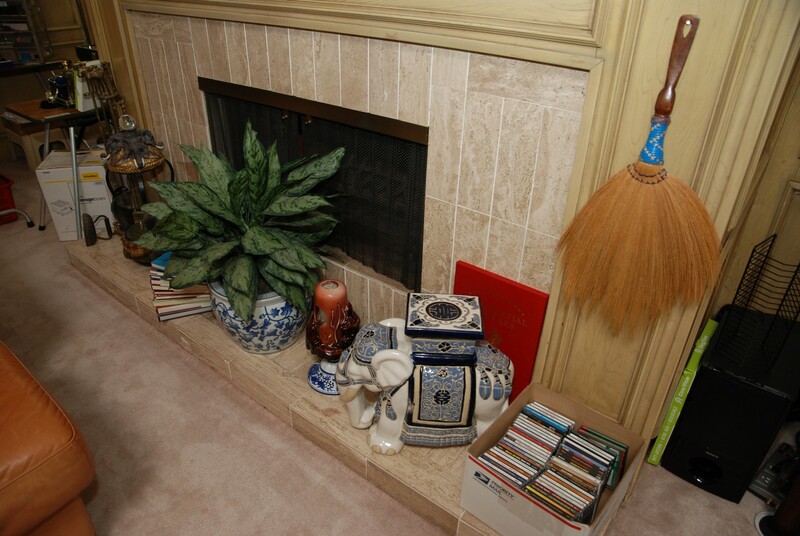 There are coffee table books and a nice plant. 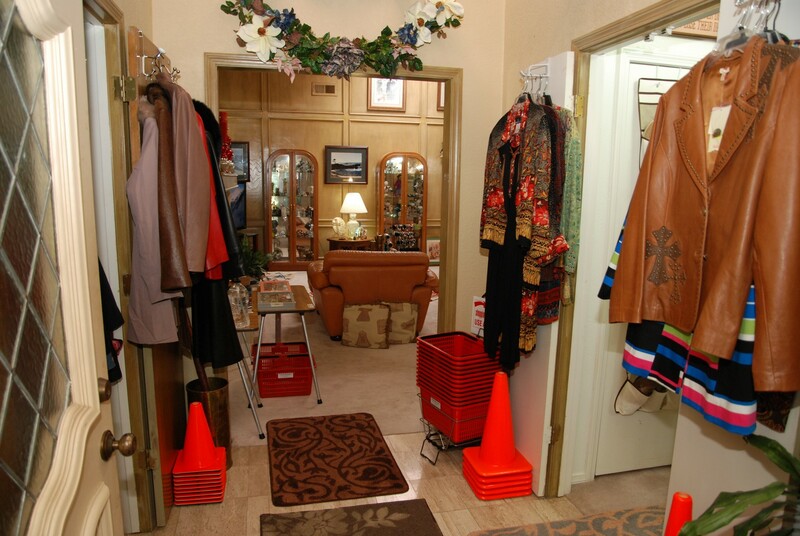 The entry has an entire double closet full of assorted women’s jackets. Some are leather, and there is a great black leather coat with black fur collar. 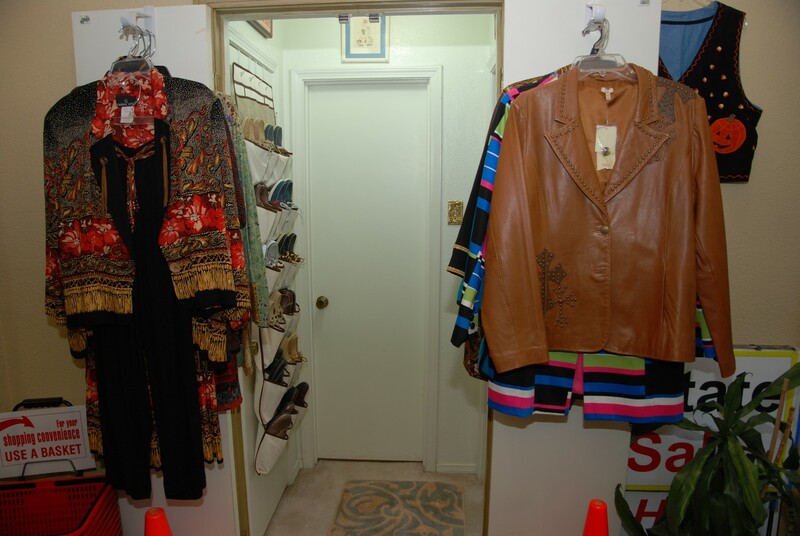 There are some very nice leather jackets (new), and other interesting clothes on the doors. 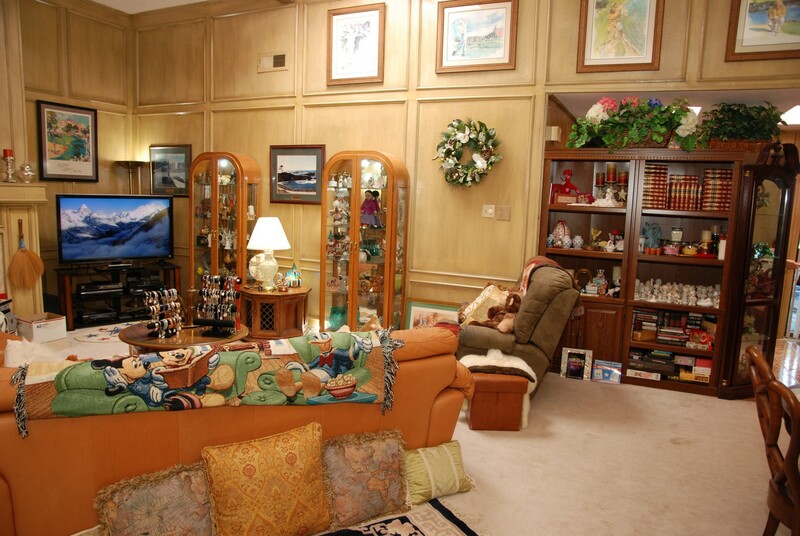 The entry also has a live corn plant in a great ceramic pot, a nice framed picture, and a floral wreath. We have an entire door of Sperry topsider shoes. Most are size 7 to 8, and many are new. 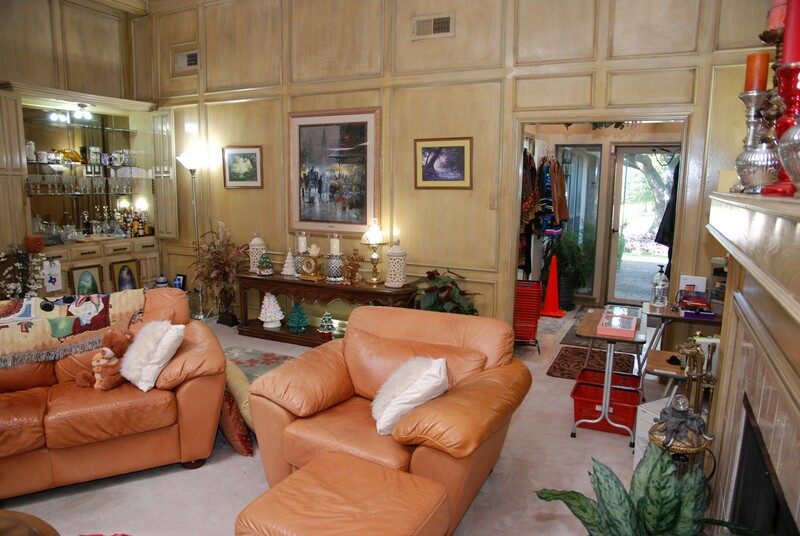 This living room also features a great leather couch with zip in back cushions and great angle arms. 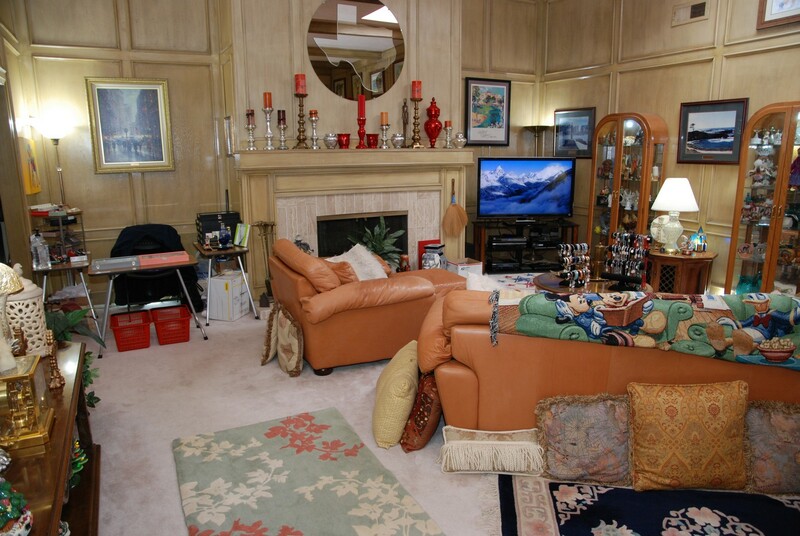 There is also a matching leather arm chair with ottoman. 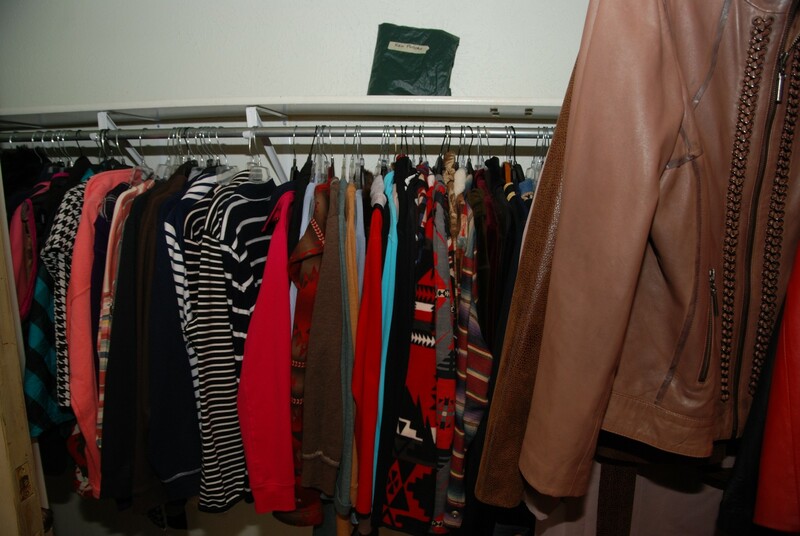 The leather is a medium shade of brown and in good condition. 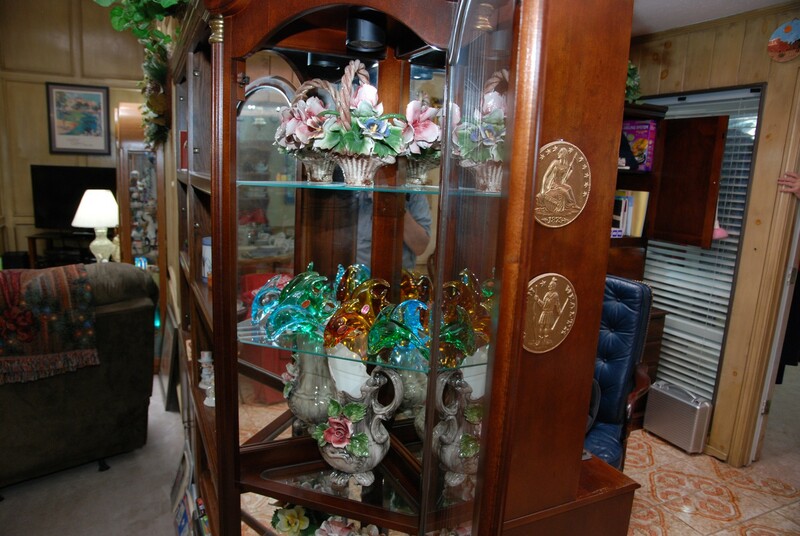 There are two rounded/arched top double door lighted and mirrored display cases. These display cases have four glass shelves each. These display cabinets are awesome. 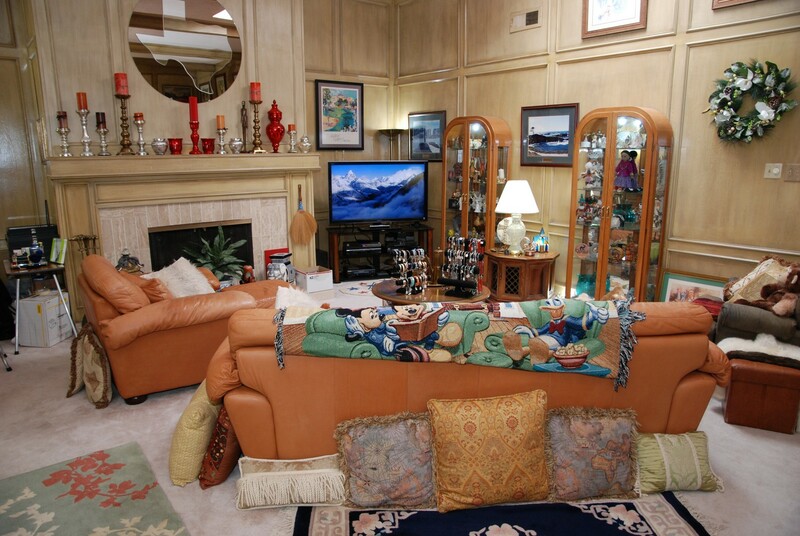 There is also a round coffee table with open display below. 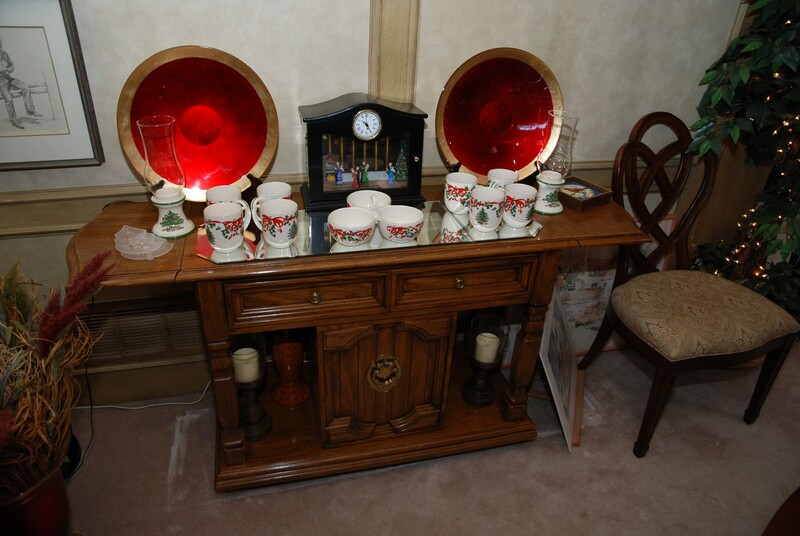 On top is a very nice coffee and tea set in brass along with a display of necklaces and a display of bracelets. We also have a barrel side table with two doors for storage, lighted stained glass church, and a nice crystal base lamp with shade (BNI). 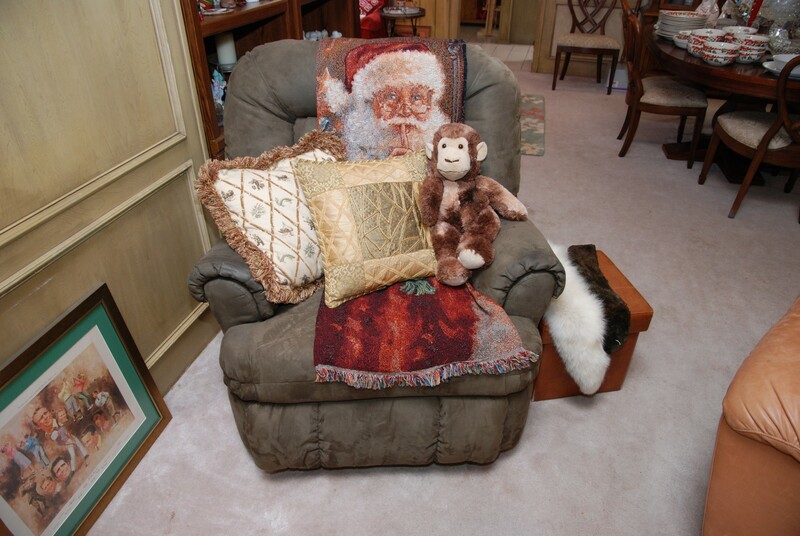 There is an overstuffed recliner in very good condition and seven collectable framed prints of famous golfers. One is the Hall of Fame. 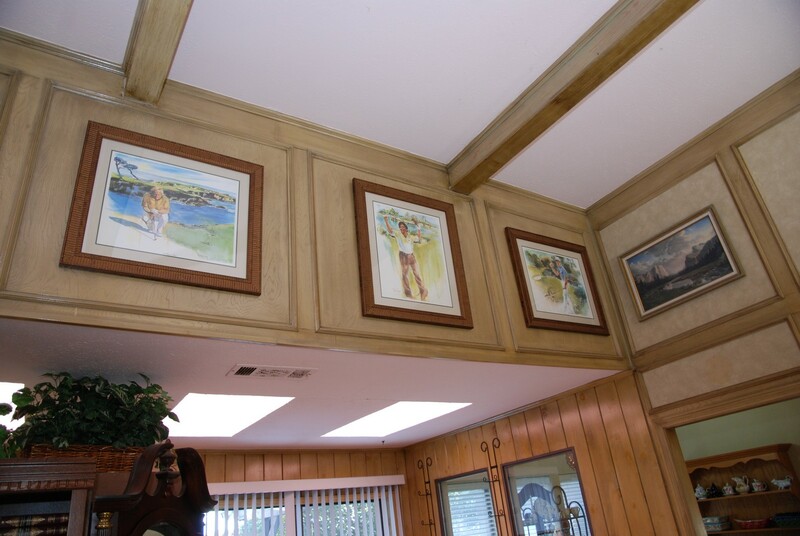 There are two other framed pictures - one is the Cypress Point and the other is the Farewell to St. Andrews. There is a box of CDs, a large box of DVDs, and a nice Sony Bravia 52” TV (remote @ checkout) has a great color picture, .and a Sony Stereo Surround sound, a Sony Blu-Ray Player system and an Infinity Bass Link black subwoofer. 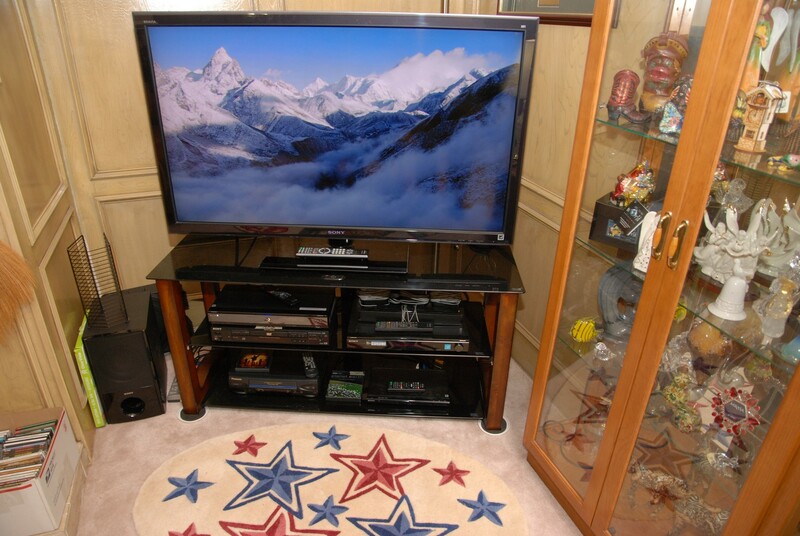 The electronics/TV stand is also for sale. It will fit nicely into a corner. 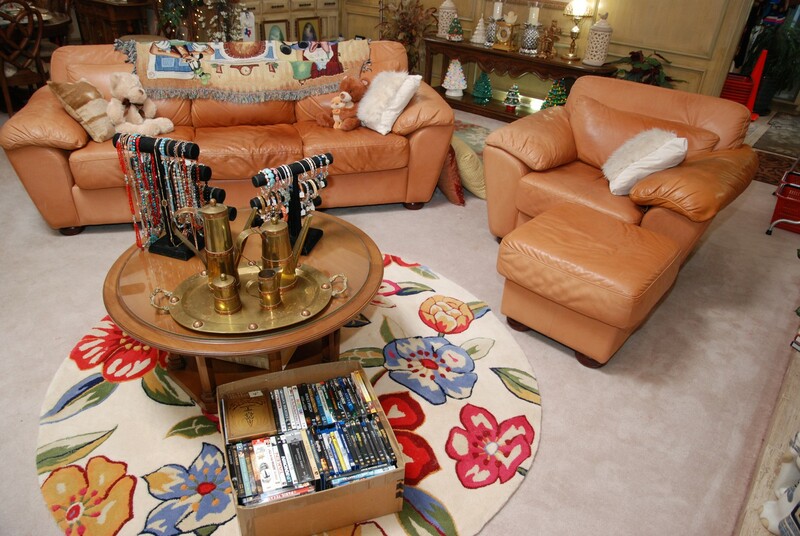 There is an oval star rug and a round flower rug along with a rectangle Asian style area rug. 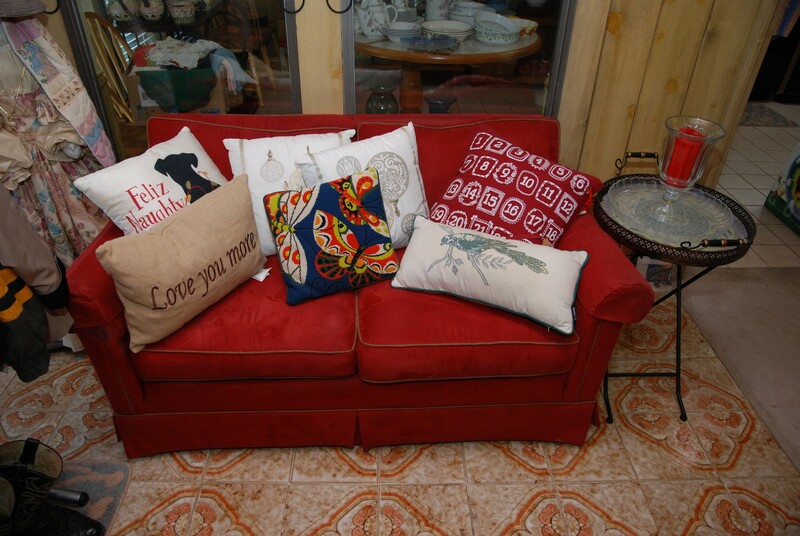 We have lots of throw pillows. 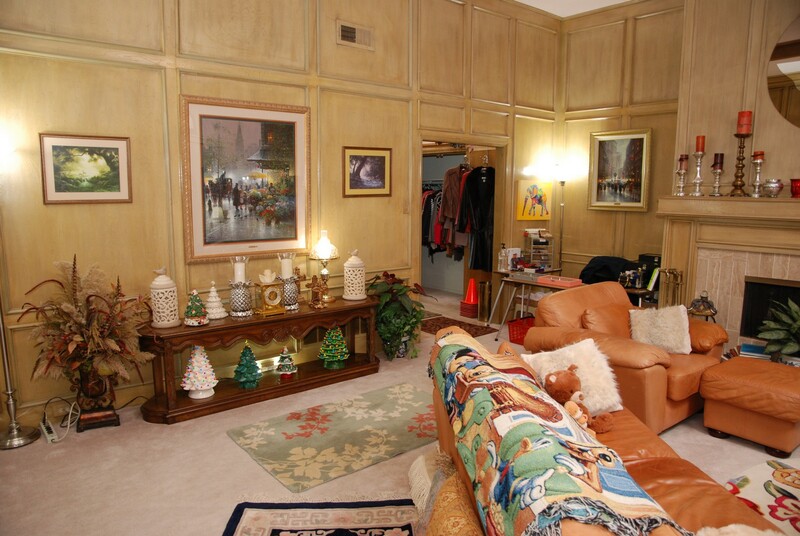 All around the room you’ll see floral arrangements and some Christmas trees (some lighted). 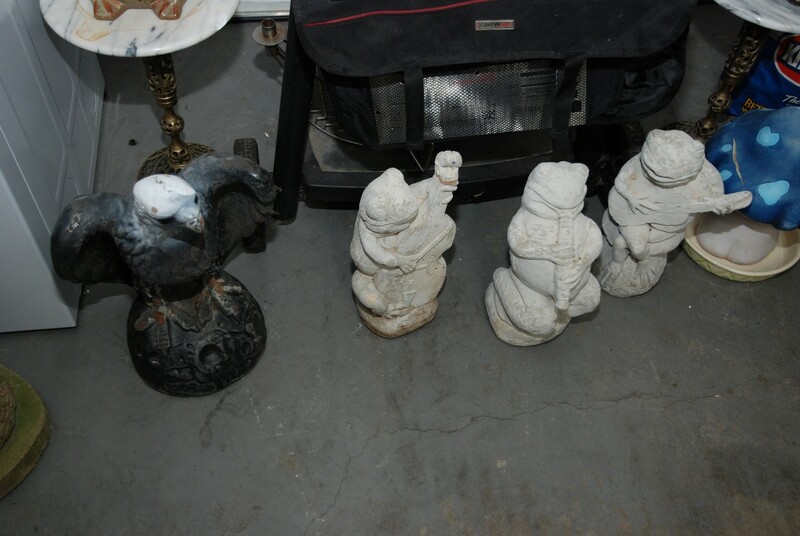 They are located on a nice long wooden entry/side table. This table also is home to some awesome ginger jars, a nice lamp (BNI), and some candles. We have an awesome Atmos Clock by Jeager LeCoultre, two silver pineapple candle holders, and Lenox and Spode Christmas trees. 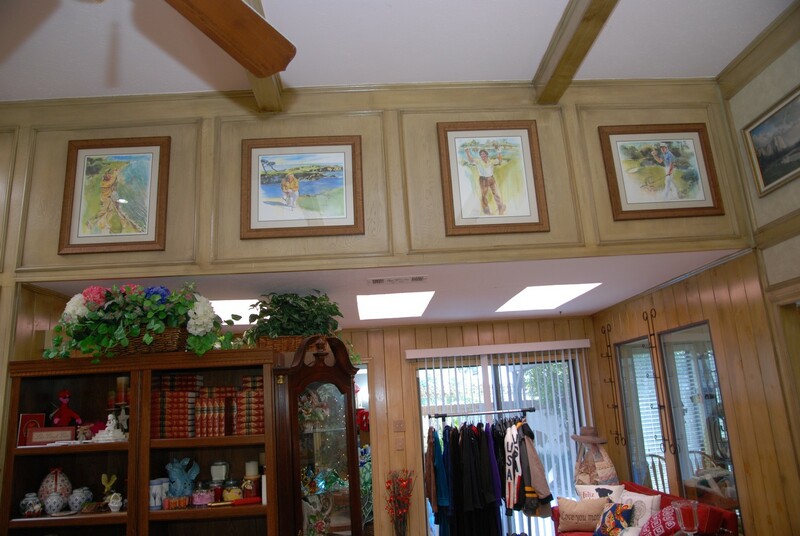 There are also some artificial potted plants along with more framed art. 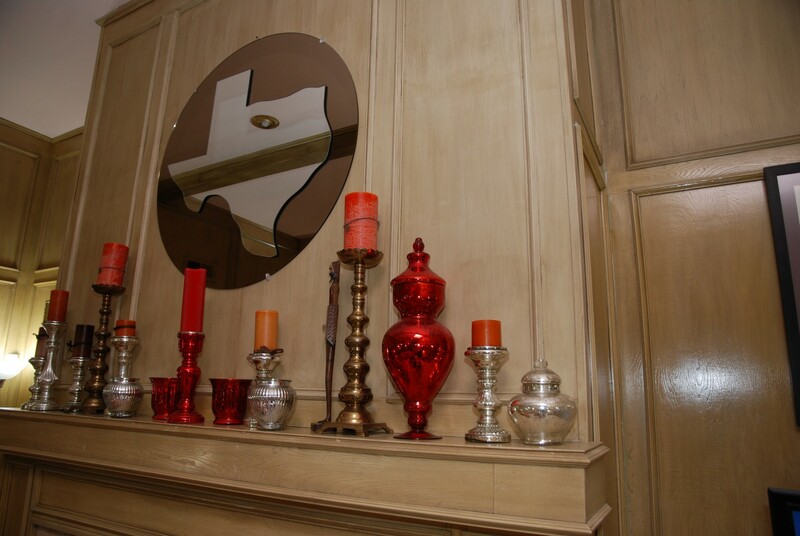 The mantel has some interesting candles with candle holders and a round smoked mirror in the shape of the State of Texas. Come early for the best selection of items. 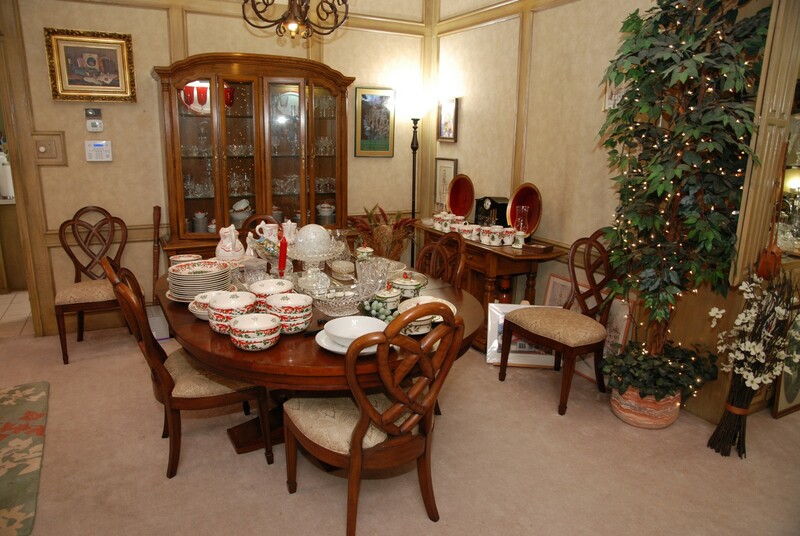 Dining Room – features Noritake china (Goldhill pattern), and Christmas Tree – Red Ribbon by Spode. 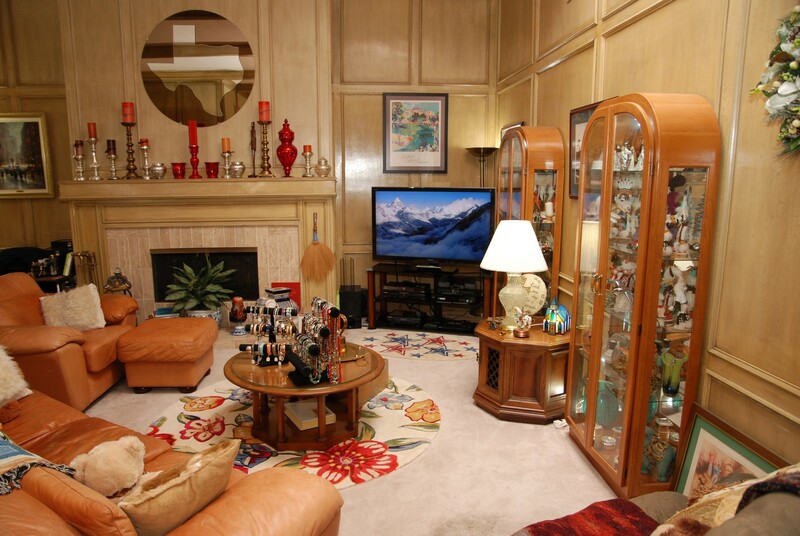 There are two side-by-side book shelves. One has a double door at bottom for storage. There is a complete volume set of the Harvard Classics (red) Deluxe Edition (50 Volume Set) in pristine condition. 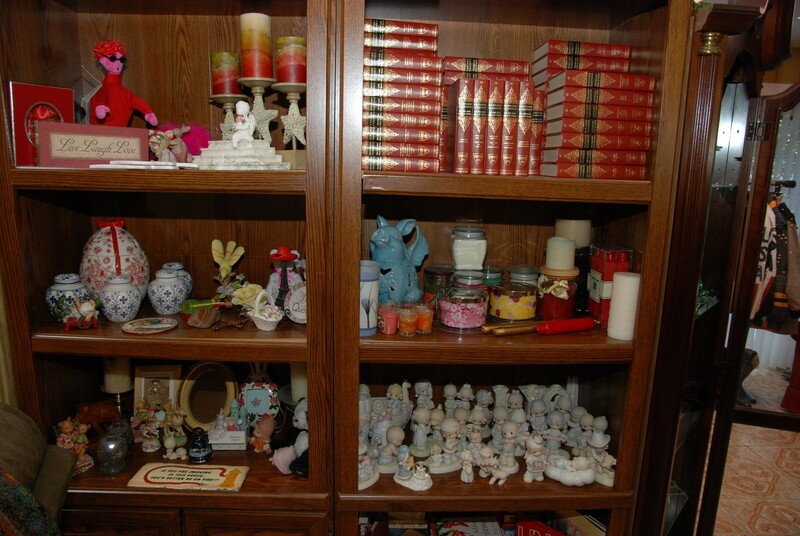 We also have new jar candles, a shelf of Precious Moments, a shelf full of games and a shelf full of books. 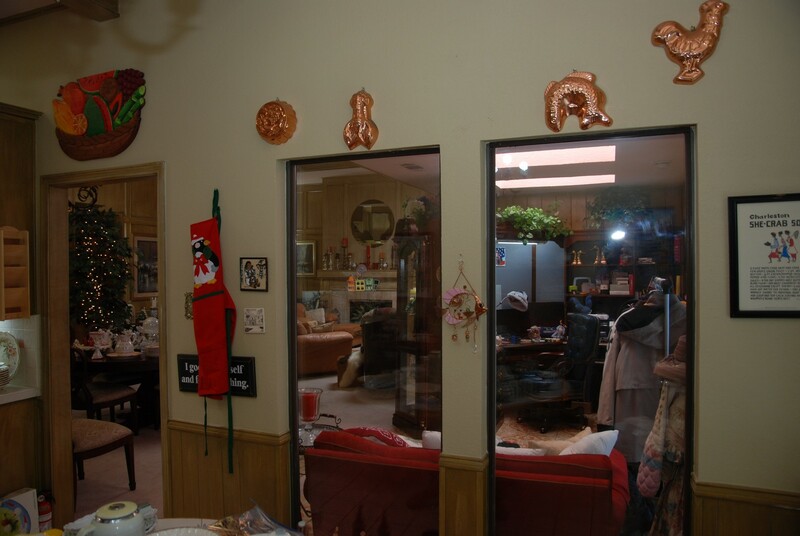 There are more candles and knick-knacks on the others shelves. 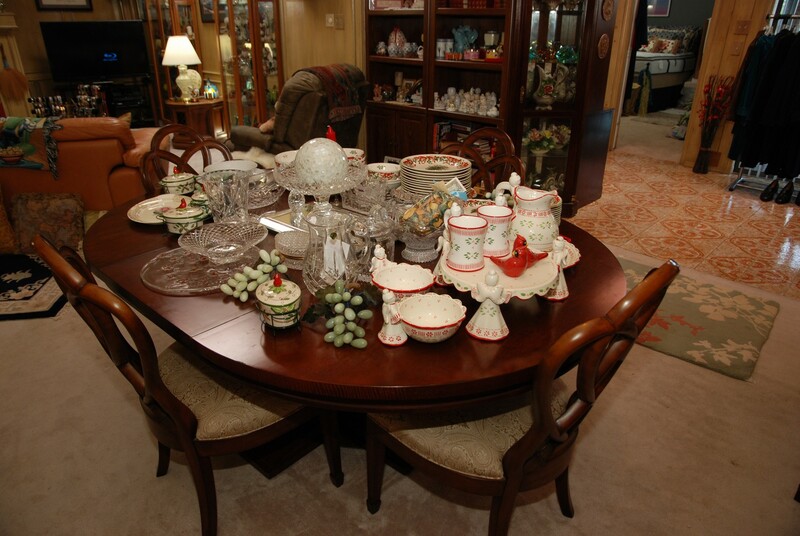 There is a large potted plant with white lights, and a Thomasville serving cart with musical dancers that plays a variety of songs, two matching red / golf plates, and a collection of Christmas dishes by Spode. 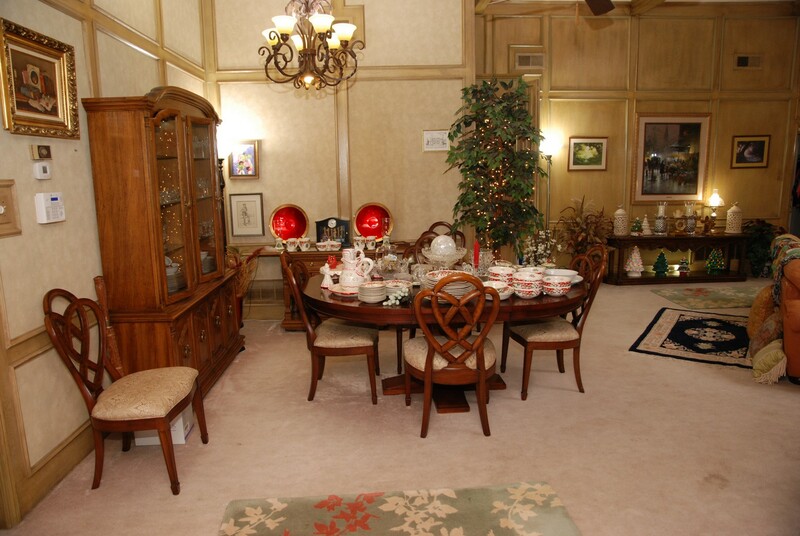 The dining room table is oval and without the leaf it is round. The base is substantial and the table itself is very sturdy. 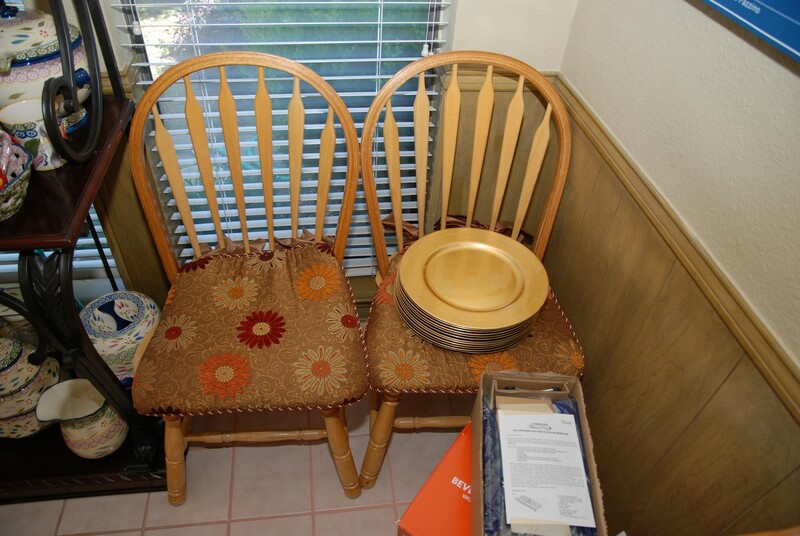 There are six wood side chairs all with cloth seats. On the table we have a variety of Waterford crystal, Spode Christmas tree dishes, and an awesome rectangle beveled raised mirror (used as a centerpiece). The centerpiece has a large raised crystal bowl with a dome that has a light under it that changed colors. It makes quite a statement - especially as a centerpiece. 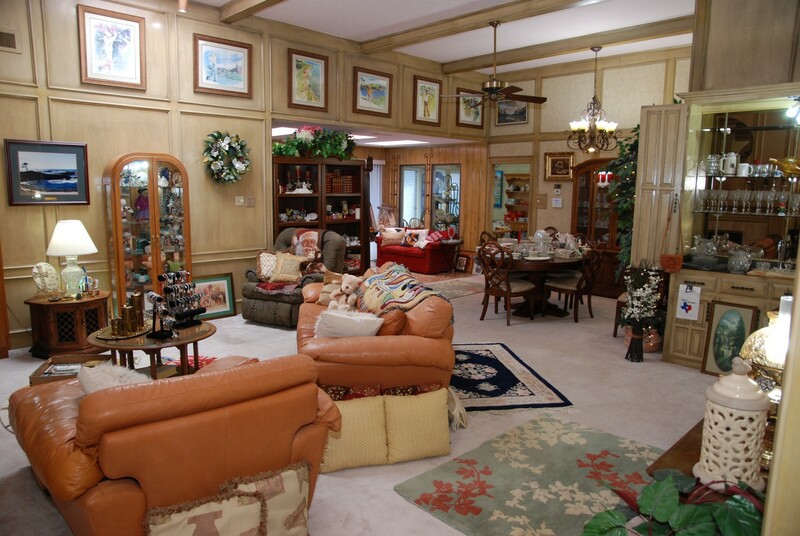 The hutch is a two-piece unit by Thomasville and has two double doors. 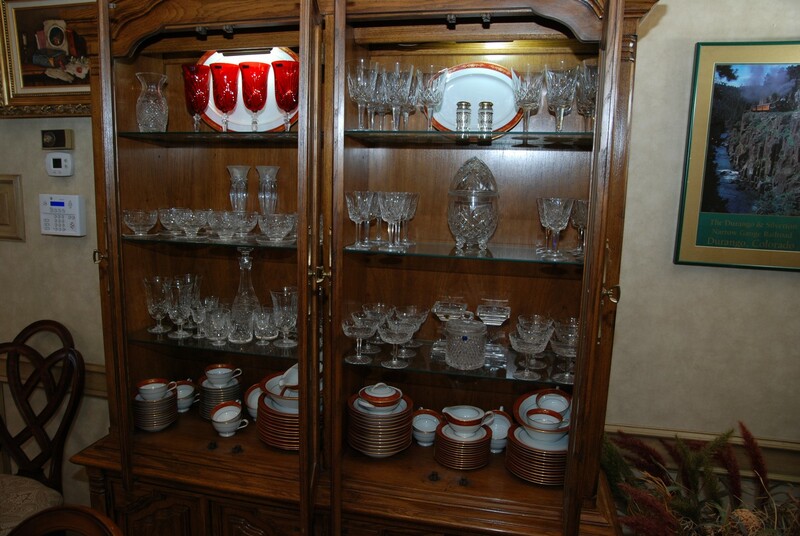 Inside the hutch is Waterford crystal and Noritake China. We also have four red Waterford goblets and six more Waterford goblets still in the box. 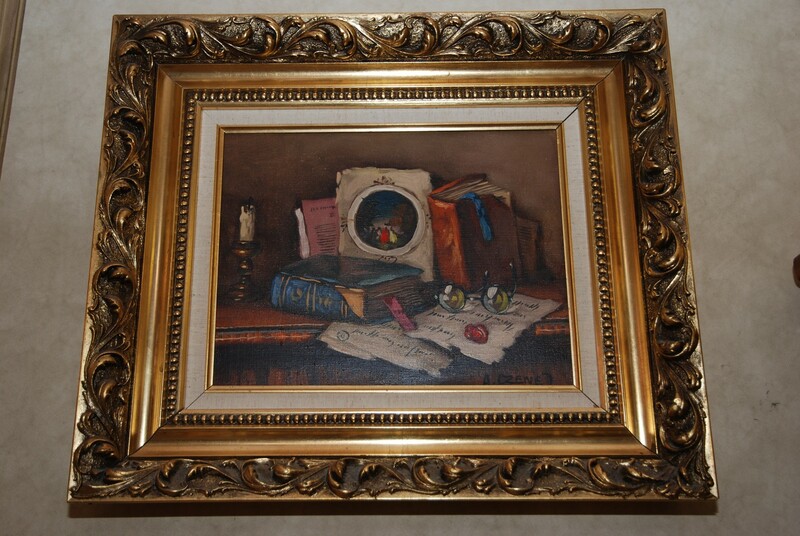 On the wall we have a framed painting of books and glasses. 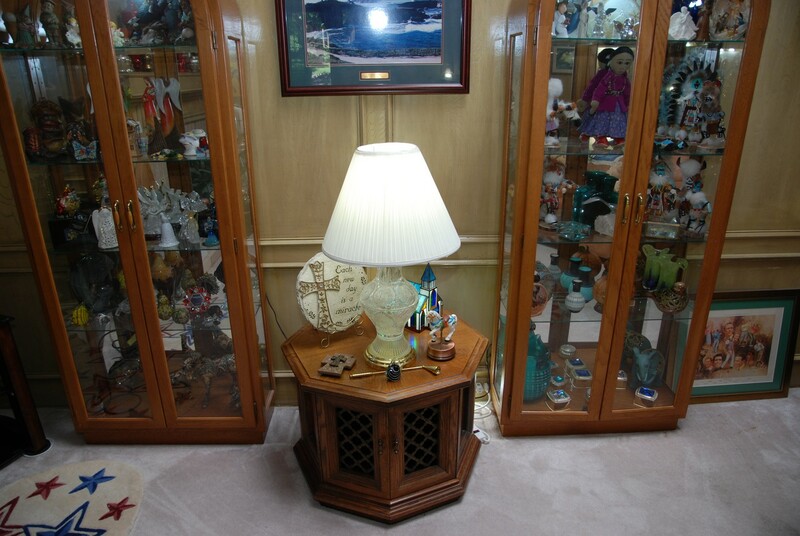 We have a lighted four glass shelf corner display case. It holds Capodimonte from Italy and murano glass fish. 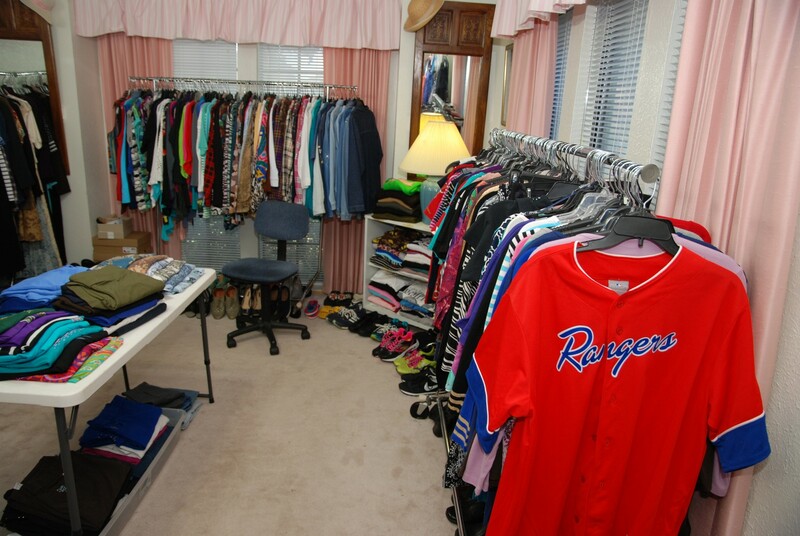 Front Bedroom / Boutique (Clothing & Shoes) – features assorted clothing sizes medium to XL. 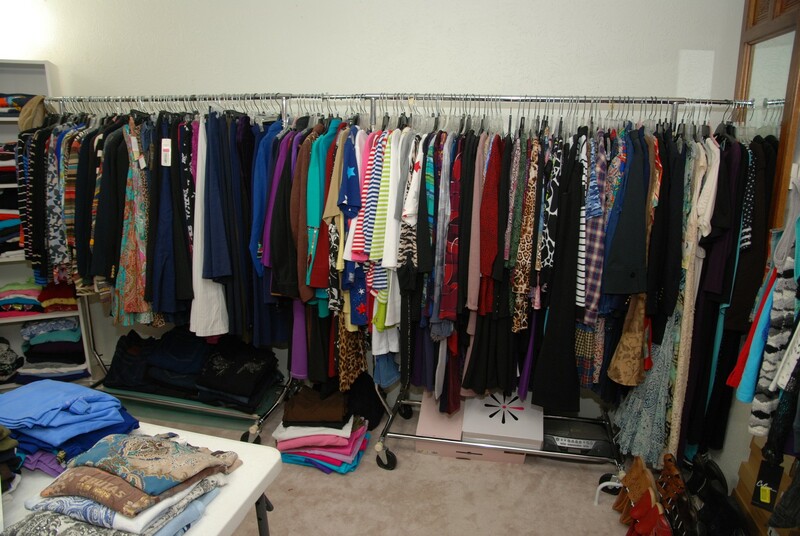 Most of the clothing will be one price for hanging and one price for folded unless otherwise marked. There are some really nice brand names like: Ralph Lauren, Bob Mackie, Reba, LOGO, Susan Graver, D & Co, Lisa Rinna, Peter Nygard, Carol Little, Isaac Mizraha, and Joan Rivers. 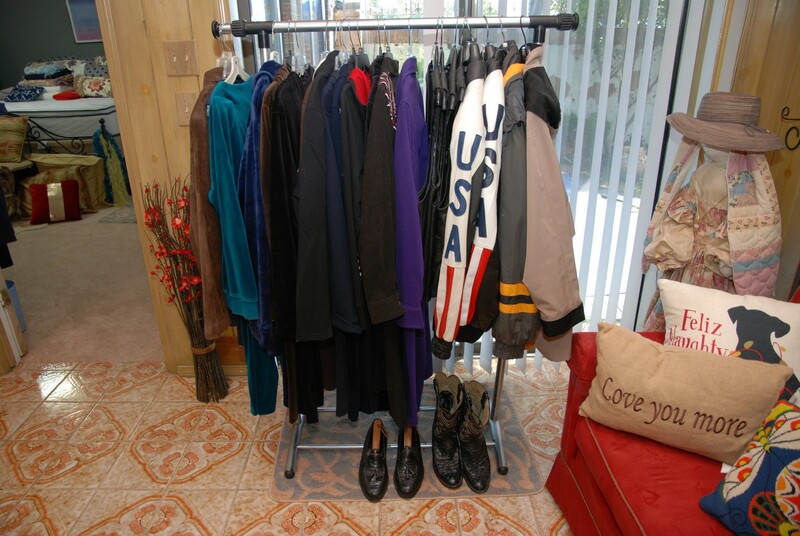 There are five clothing racks, two shelves and a middle table plus shoes and boots. The shoes are size 7 to 8 The shoes are nice brand names like: Merrell Ortho Life, Merrells, Clarks, Rybo, Barefoot Ride, Merrell Fur Lined, Sketchers, Earth Origins, Oasics, Isaacs, Cobb Hill by New Balance, Easy Spirit, Fila, Sperry Topsiders, Danskins and Uggs –boots (new in box). 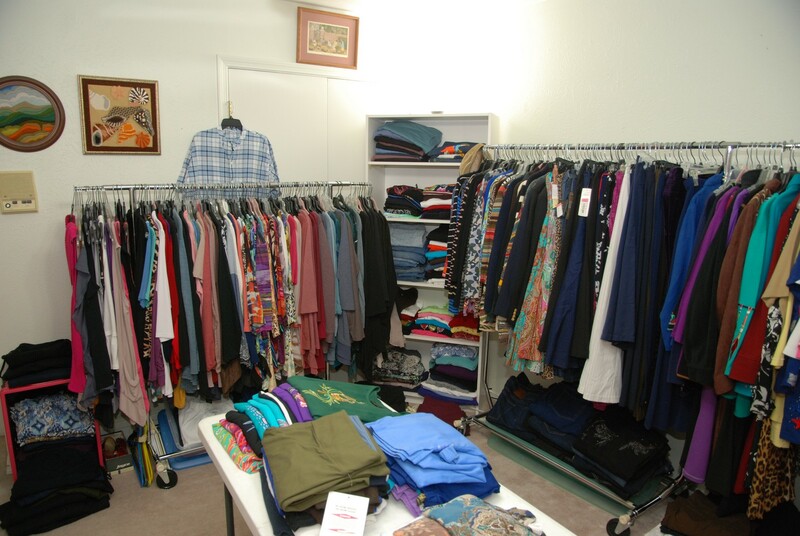 There are sweaters, pants, dress pants, jeans, casual pants, leggings, workout, skirts, tops open jackets, jackets, dresses, formals and vests. Come early for the best selection. 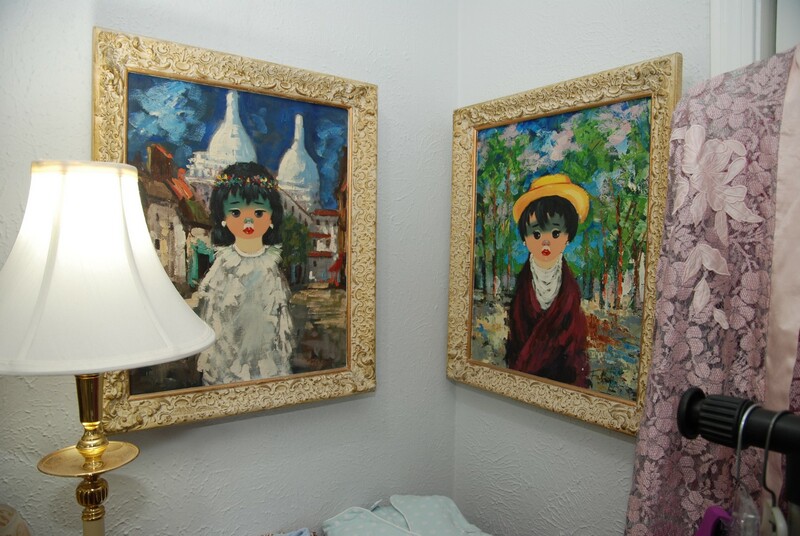 This room also has some nice wall art, two wood framed mirrors, and a nice table lamp with shade (BNI). 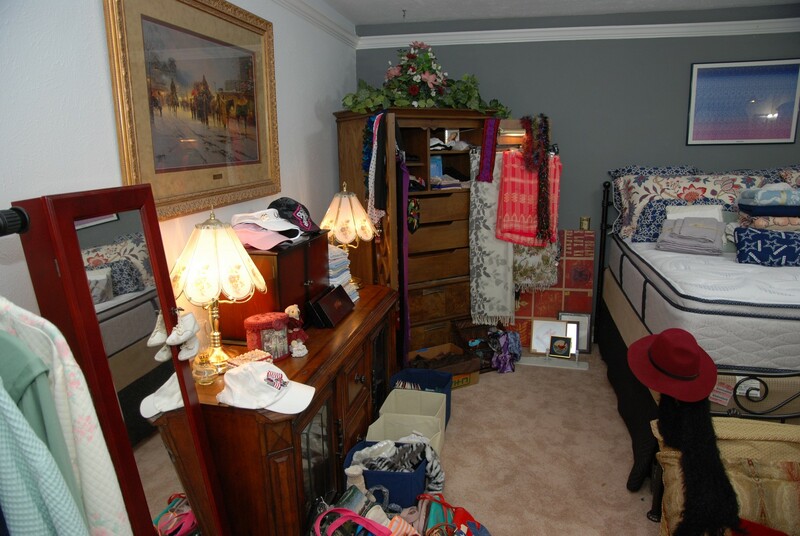 Please try and keep clothing a neat as possible so others can enjoy finding the items they want. Thank you. 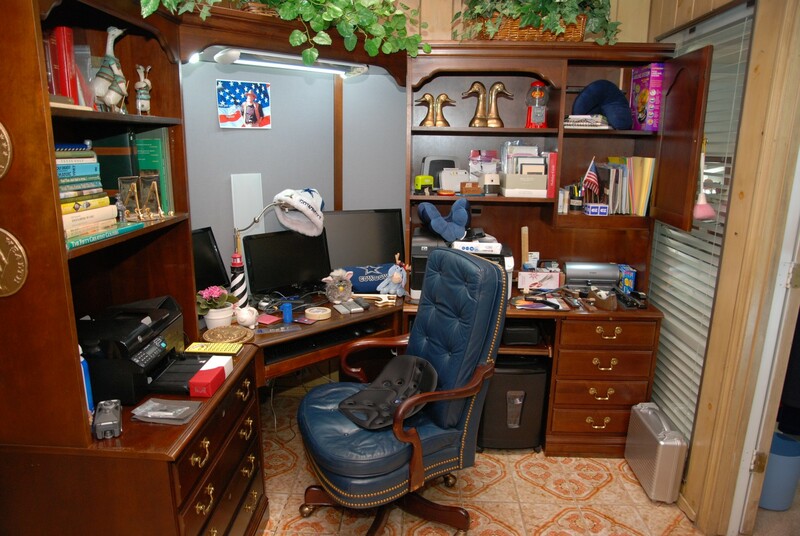 Office / Den Areas – features two Dell Monitors and one Asus Monitor. There are three Keyboards and two Mice. We have a box of MISC cables, along with a shredder. 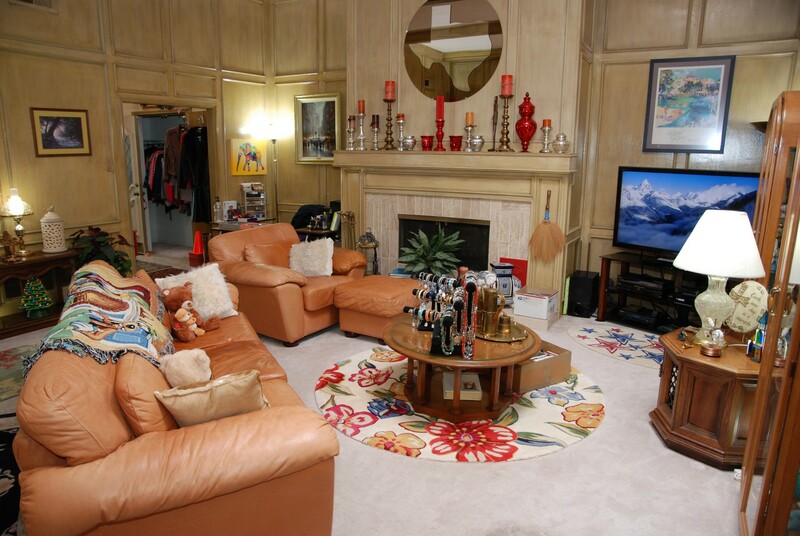 The den area has red suede-like love seat with lots of interesting throw pillows. The tall hare in the corner covers a nice vacuum cleaner. 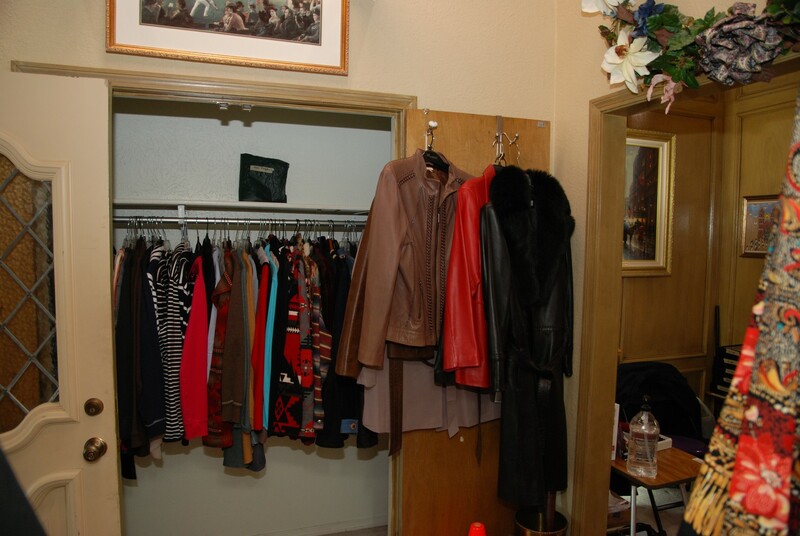 There is a clothing rack that holds some very nice high end jackets and coats. There are two USA leather jackets (awesome) and outerwear. Some are suede, and some are cloth. The office furniture is very nice with a corner unit that has a pull out keyboard drawer with a light bar. The right side unit also has a pull out keyboard drawer, two regular drawers and a file drawer. 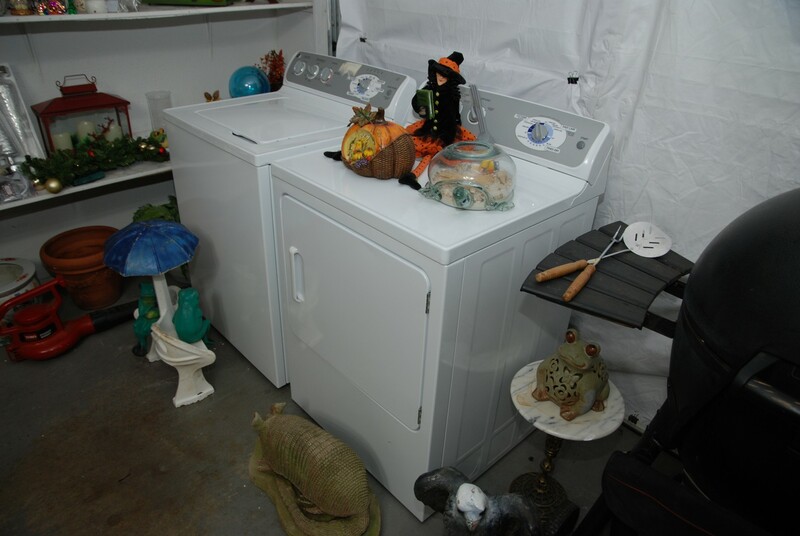 This unit also has an upper unit with a closed section and a double open shelf. 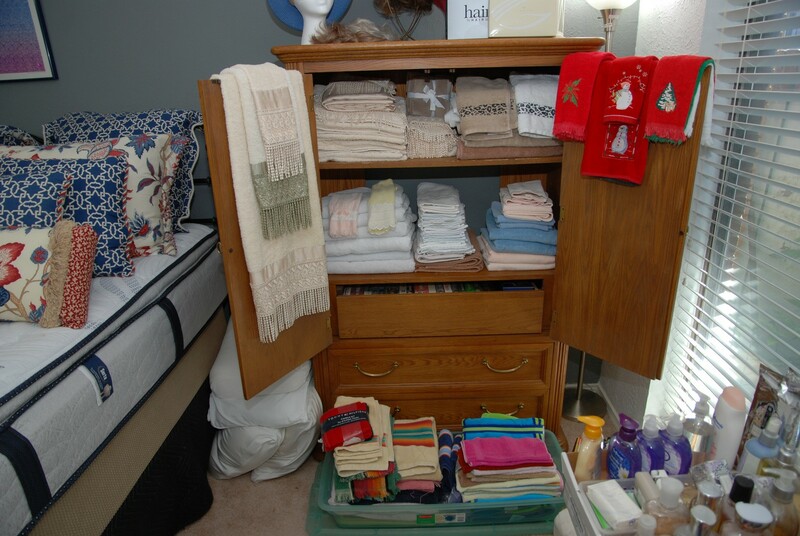 The left side unit has two file drawers, and the upper unit has two open shelves. All three of these units will sell together due to the light bar on the corner unit. These units hold a section of religious (Catholic) books. 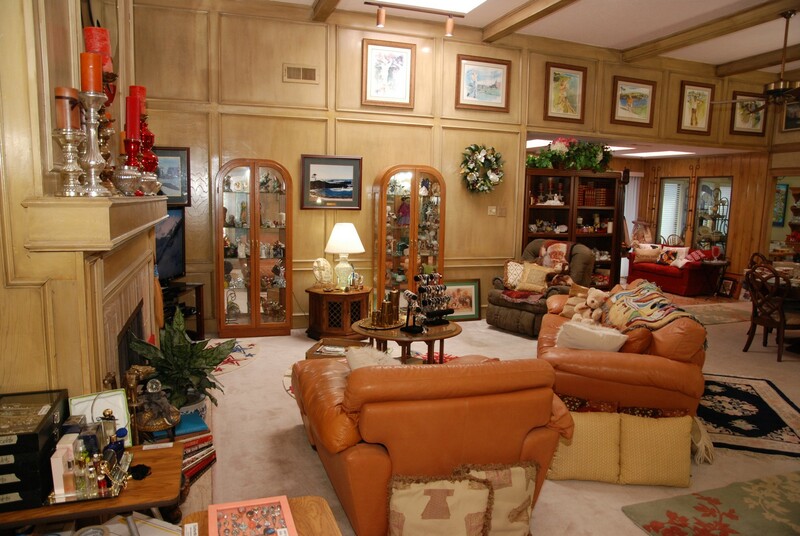 Another large shelf is dedicated to golfers (with books, book ends, and a golf statue). There are two HP printers. 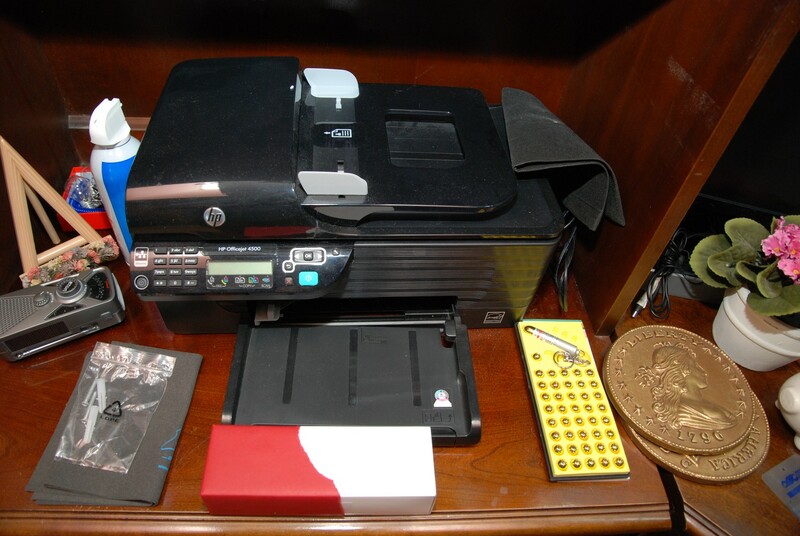 One is an HP 4500 and the other is an HP Officejet Pro 8500 Wireless. 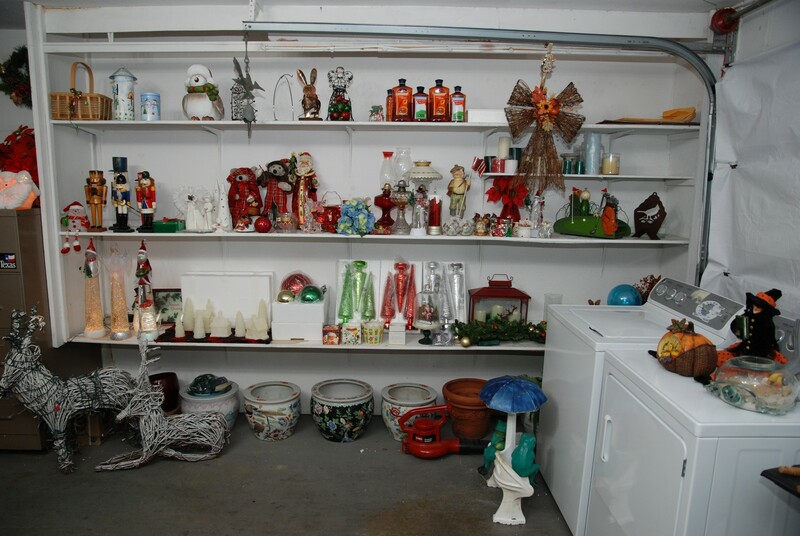 This section also holds lots of office items. There is a floor model shredder. There is also an executive high back office chair with wood arms with navy blue leather seat and back. Come early for the best selection. 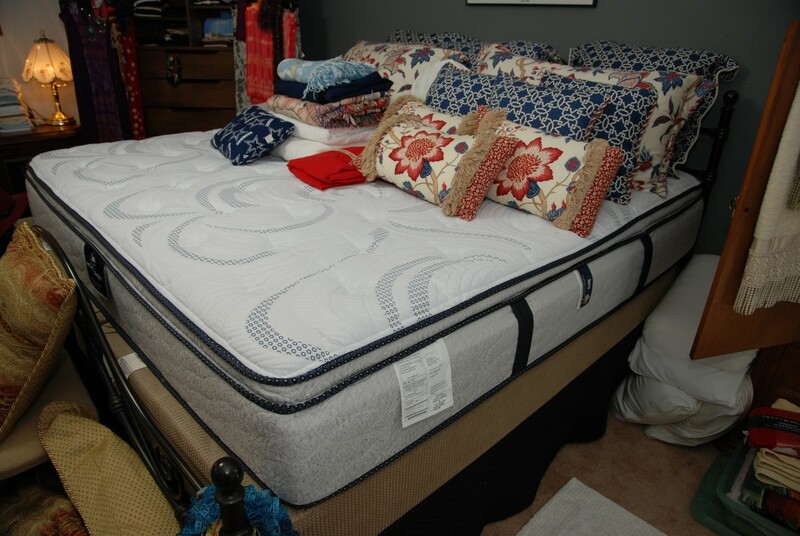 Master Bedroom / Accessories / Bath Items – features a very nice king mattress and box spring by Serta -Perfect Sleep designed and built in the USA, along with lots of king bedding. 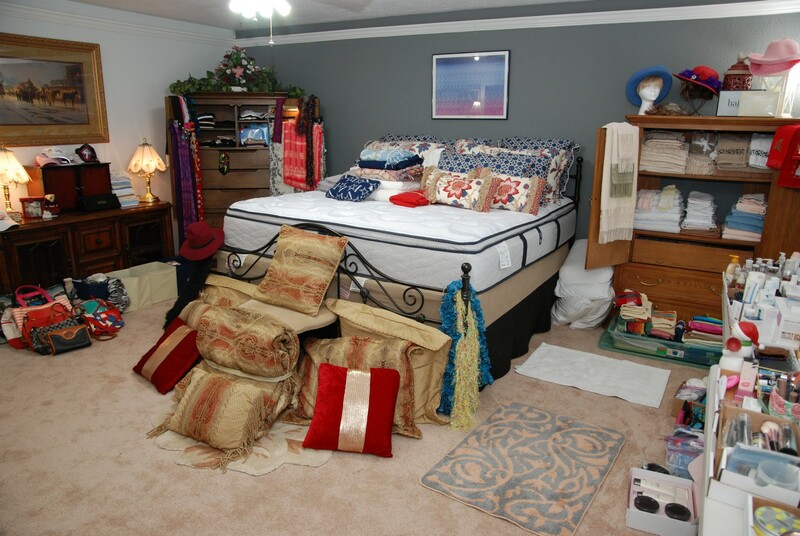 There are throw pillows, area rugs, and towels. 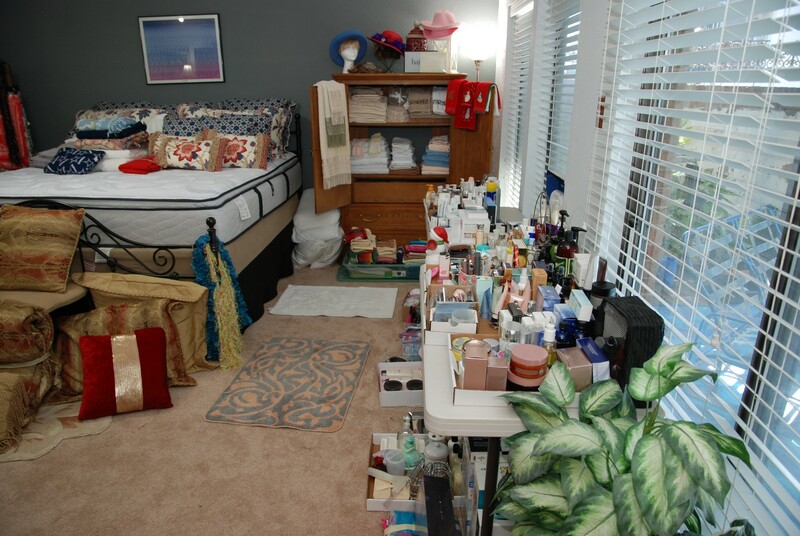 We have a large selection of cosmetics, over the counter items, shampoo, and conditioner, and much more. There are two tables overflowing with goodies. 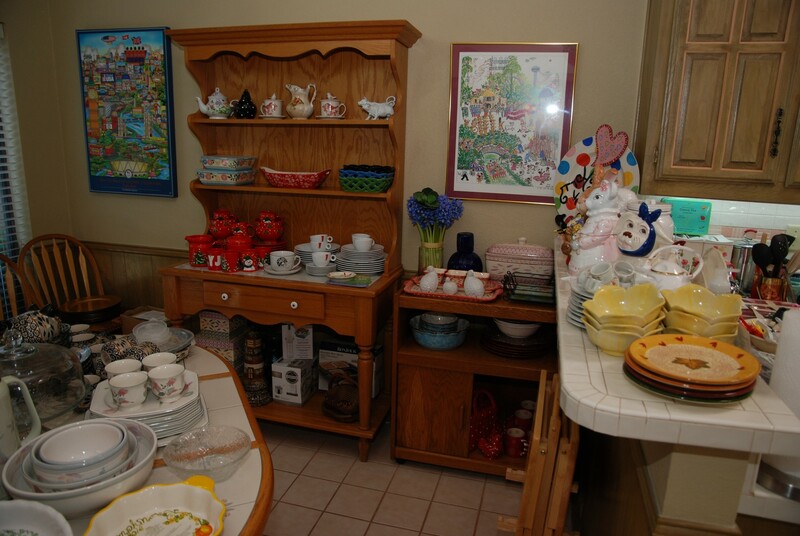 Under the tables we have new items (still in boxes) and more over the counter bathroom items. Come early for the best selection. 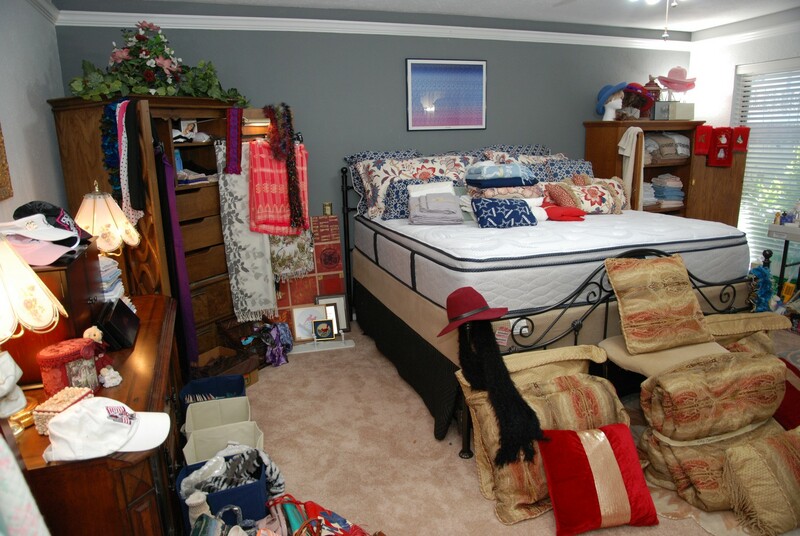 This room contains ladies hats and caps, wigs, and lamps with shades (BNI), including two touch lamps. 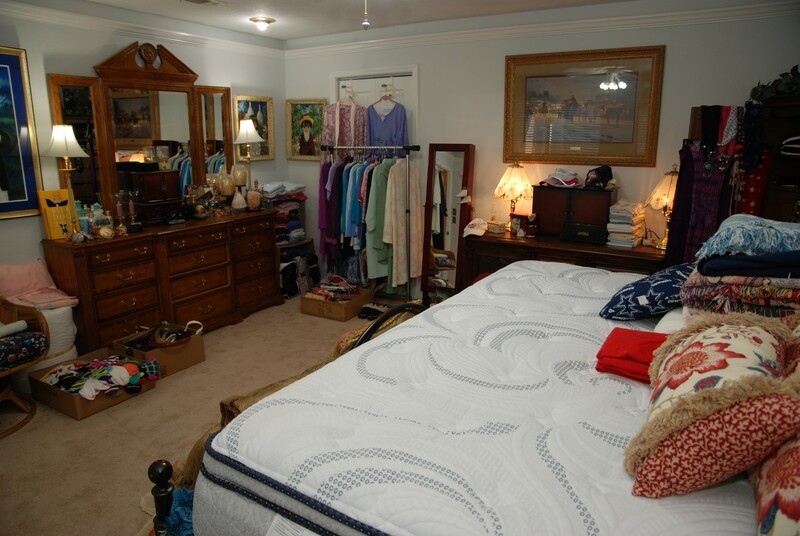 We also have a double shelf and double door with bottom drawers for storage Armoire. There is another all wood taller unit that has two shelves and multiple drawers with double doors that hide all the selves and drawers. On the wall next to this unit is a long dresser / display unit. 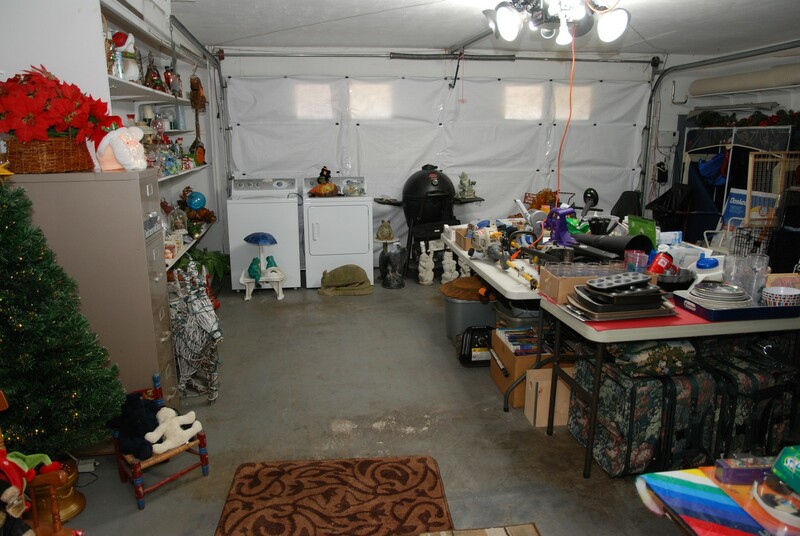 This unit has glass doors at each end to show collectables. 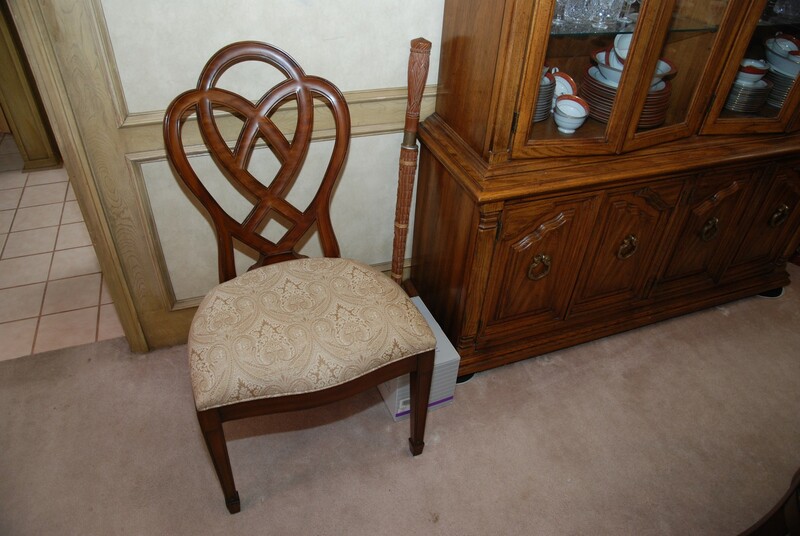 In this large master we also have a rattan chair with arms and pads. 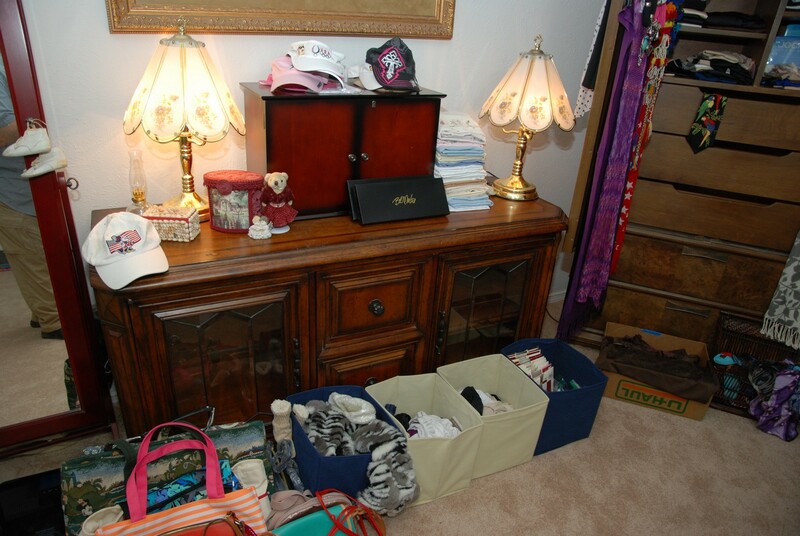 We even have an awesome triple dresser with a tri-fold mirror. This dresser has four drawers in each of the three sections. 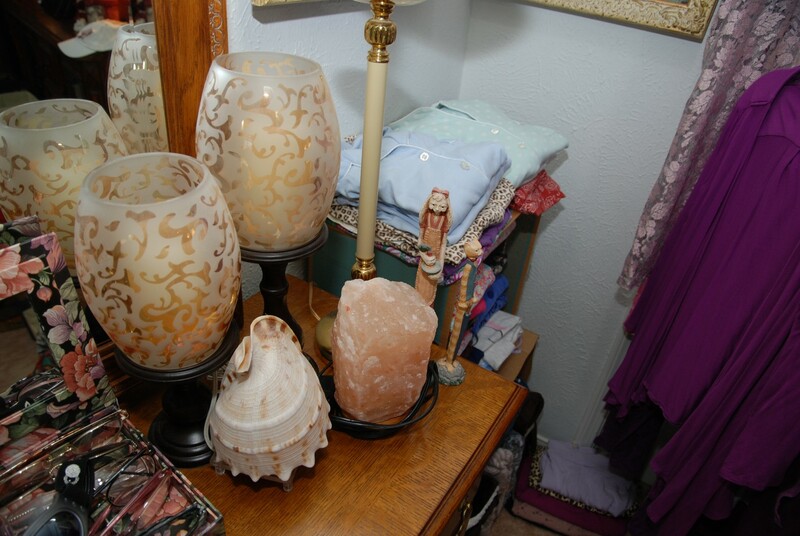 This dresser has two nice tall lamps with shades (BNI). 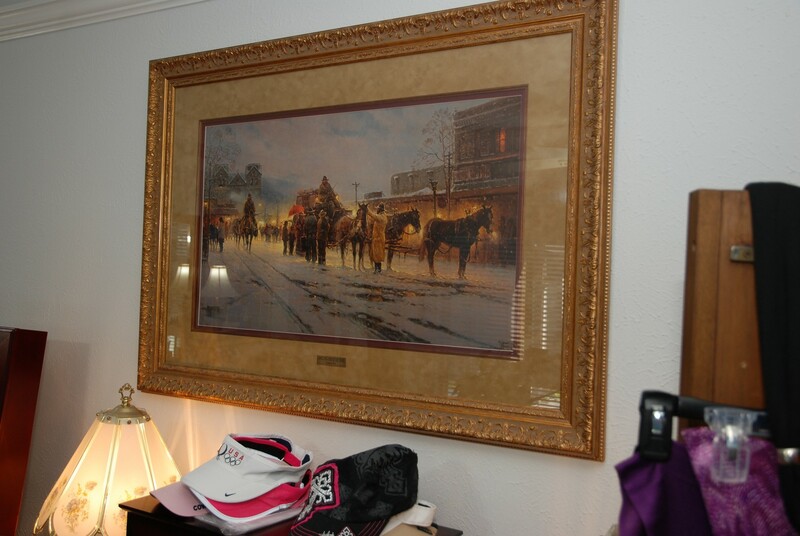 We have a large framed print of Santa Fe –End of Trail by G. Harvey. 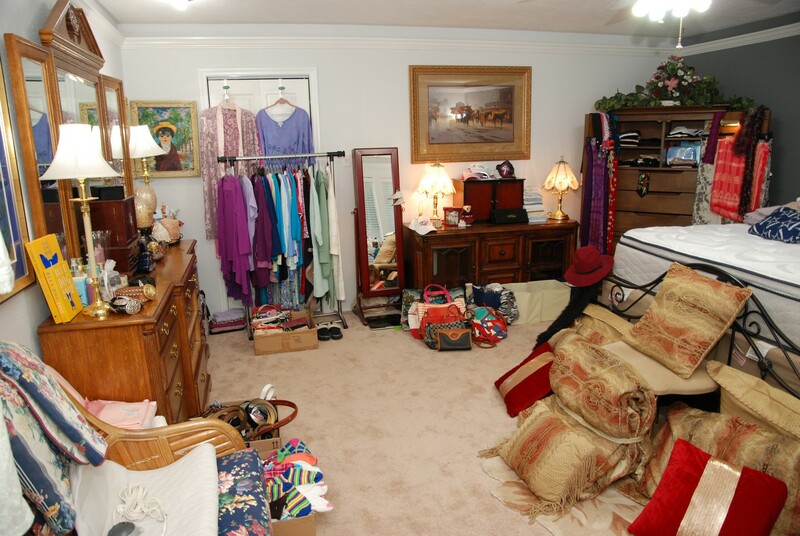 This room also contains; candles, lingerie, belts, socks, scarves, bras, slippers, sleepwear, purses, two weight scales, wallets, coin purses, and much more. 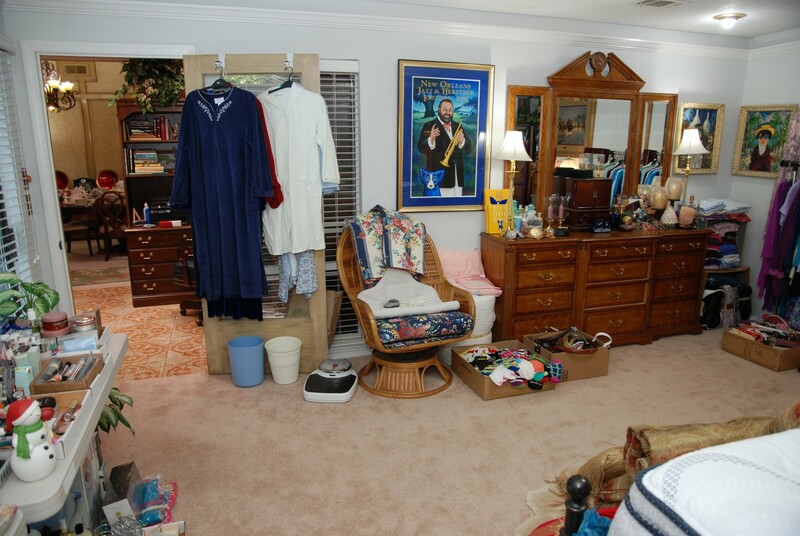 Consider visiting this room first as it has so much stuff. 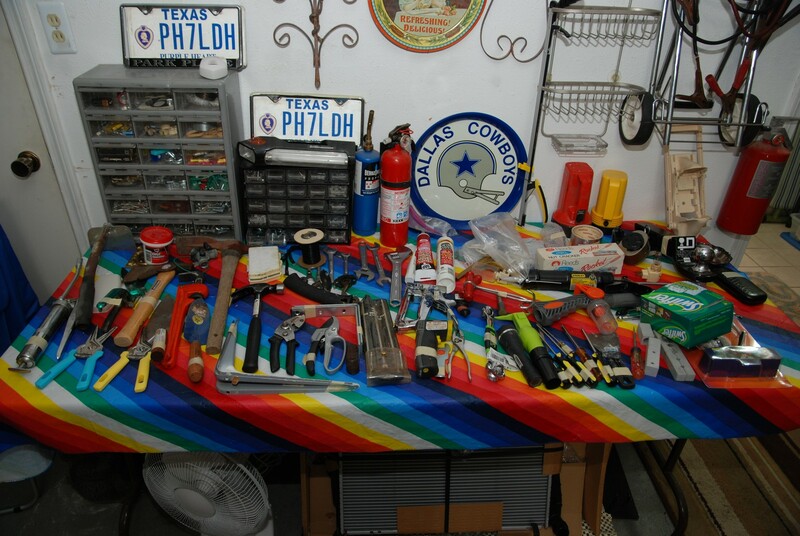 Please try and keep the items you look at neat – Thanks. 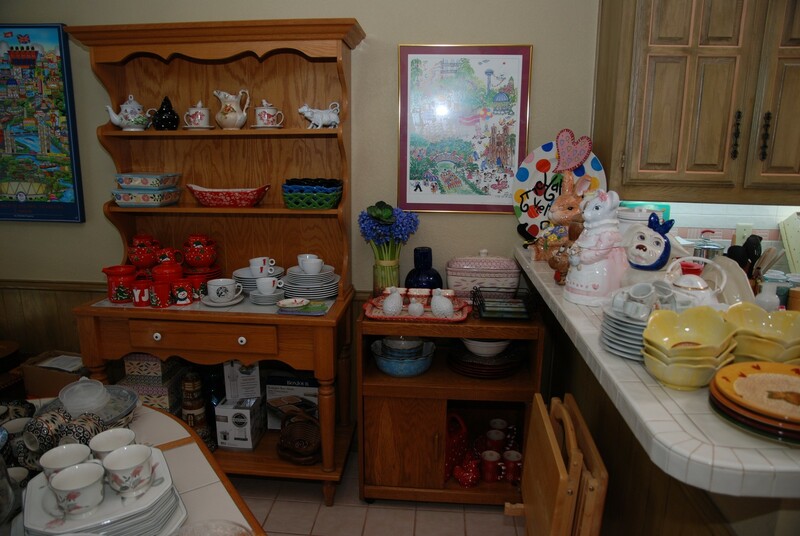 Kitchen / Eating Area / Collectables – features assorted Temp-tations by Tara. 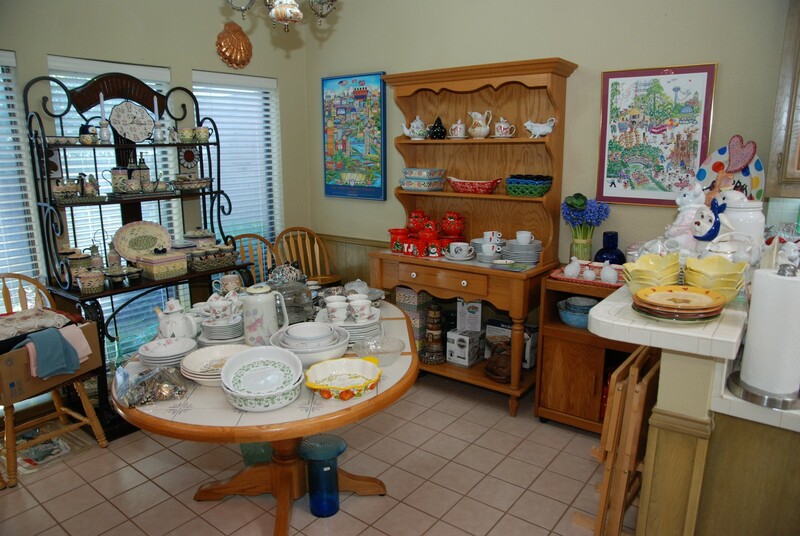 There are cups, Bowls, Casseroles, Salt and Pepper, Oil and Vinegar, serving dishes galore, and much more. 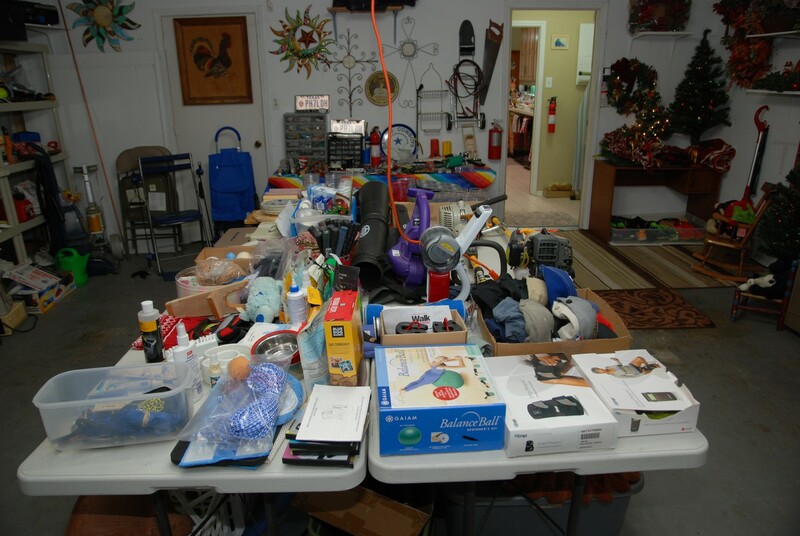 We have a nice Keurig coffee maker, a blender, a toaster oven, and a hand mixer (with lots of attachments). There is Mikasa Fine China – Patricia and Savoir Vivre – May Flowers, Mikasa Continental – Silk Flowers. 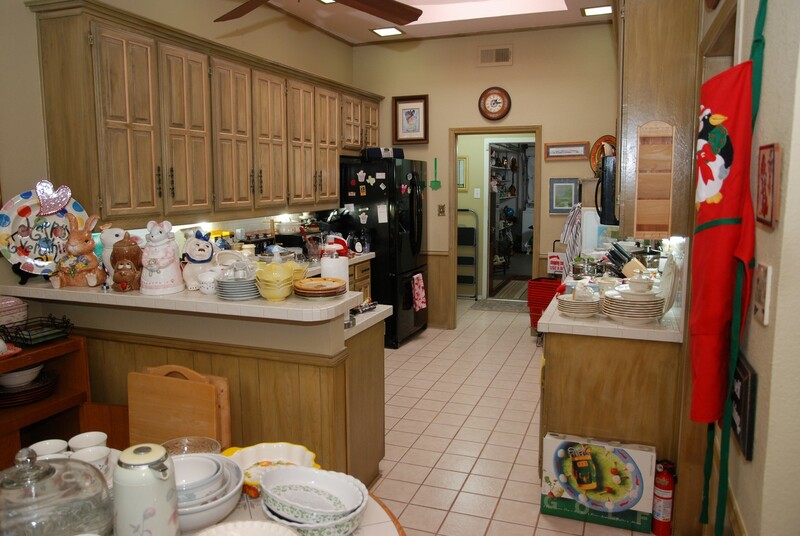 This large kitchen also has some nice pots and pans, Corning ware, multiple sets of dishes, and Mickey and Minnie Mouse cups. 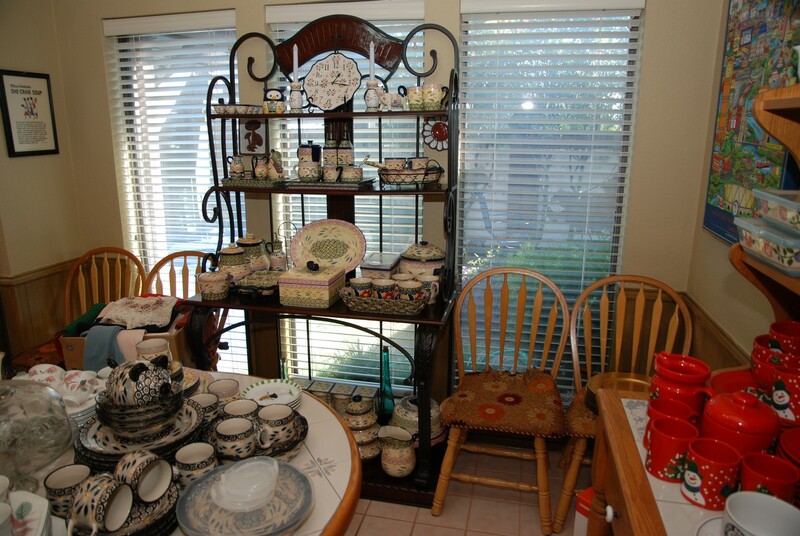 There are many very cute and collectable cookie jars, plates, bowls and tea sets. 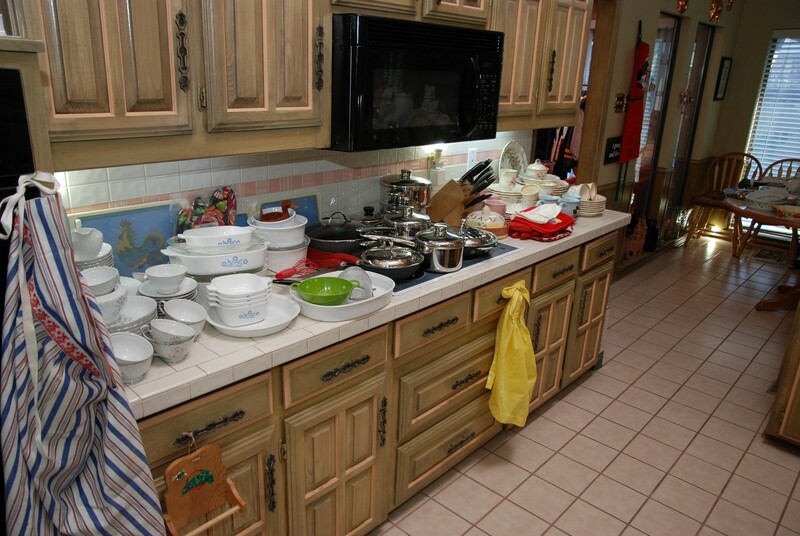 We have a nice selection of casseroles (some have covers). There is a nice round table, and with the leaf it’s oval. 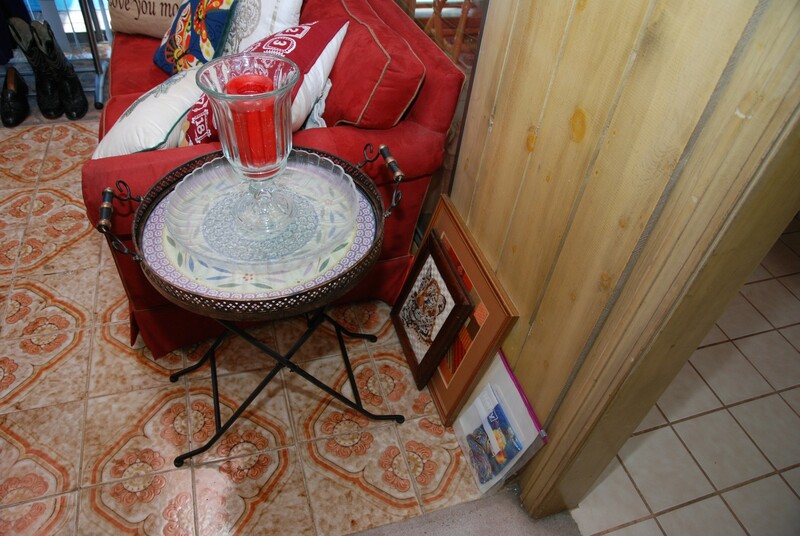 This table has a tile top and holds Mikasa and Temp-tations items. There are four side chairs with seat pillows. 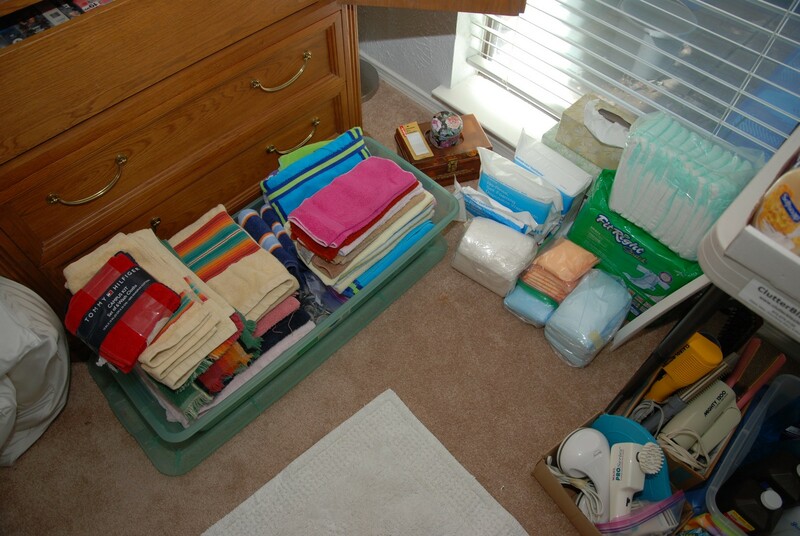 There is a box of linens that contains lots of placemats and napkins and a few tablecloths and doilies. We also have a set of Studio Nova – Tender Bloom dishes along with a ceramic light house, and many new items still in boxes. There is an open “farmers” Hutch (two pieces). It has one single drawer in the middle. 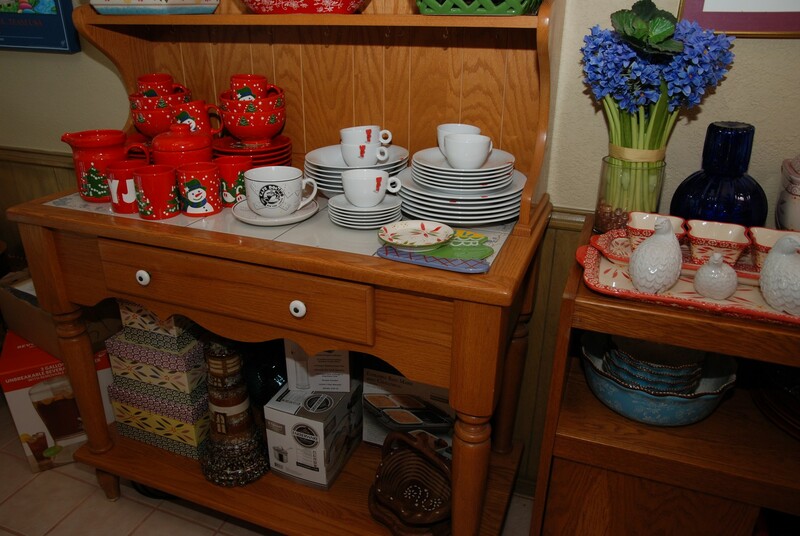 The bottom part of the hutch also has a tile top. The microwave cart features more Temp-tations and a blue glass bedside water pitcher with matching glass. New in box is a speed slicer – it has six pieces with stainless steel “v” blade and a julienne strips. On the window sills we have a variety of items including a large blue glass jar and many other glass items. We have single knives, steak knives, and a knife set including its own wood block. We have a set of Siam Brass flatware complete with serving pieces. Come early for the best selection. 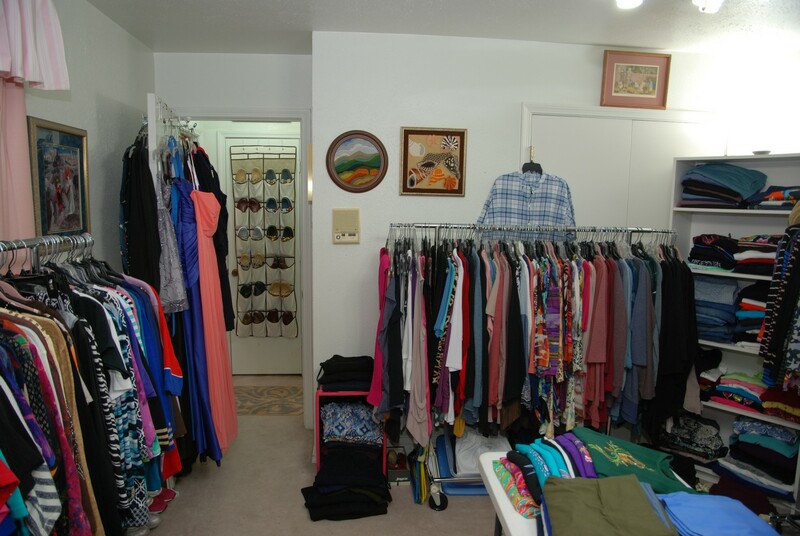 Utility Room / Pantry – features two Ironing Boards and Two Irons. 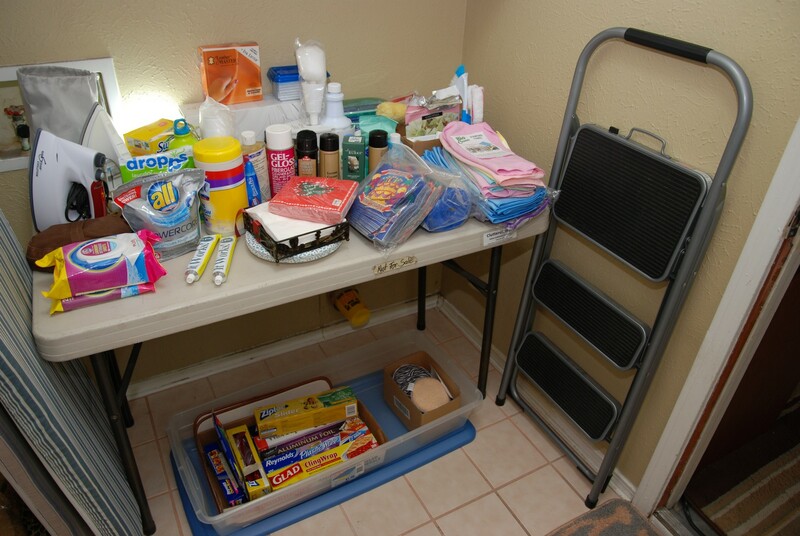 There are assorted cleaning items, paper products, towels, trash bags and laundry items. There is a nice Costco step stool and lots of canned goods, spices, and plastic ware. 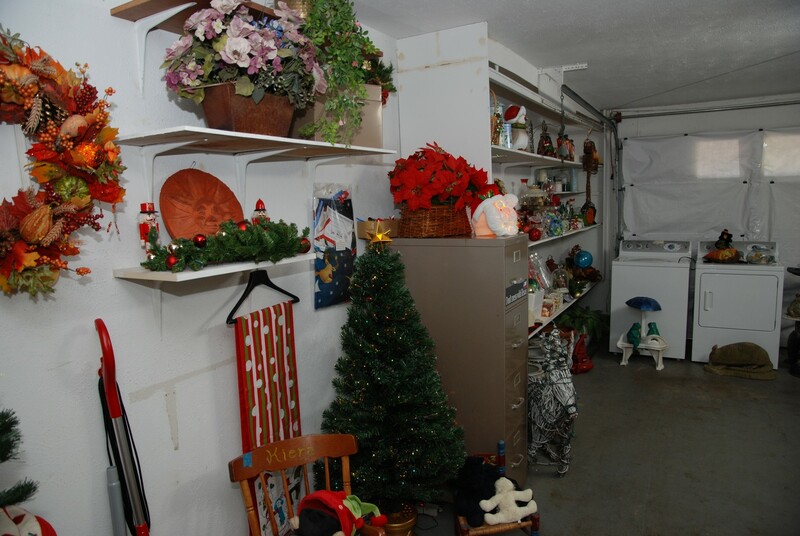 Large Double Garage – features two Fiber-Optic Christmas Trees, lots of assorted decorations and lots of interesting candles and wreaths. We have two children’s chairs. One is a rocker. There is a four drawer legal-size file cabinet, and decoration for both inside and outside locations. 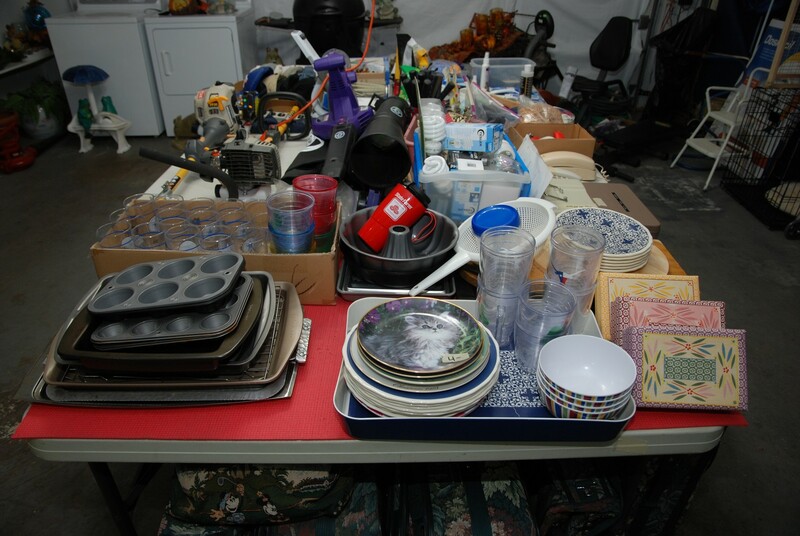 There are baking pans (some like new), Cowboys glasses and a complete set of luggage (sold separately). 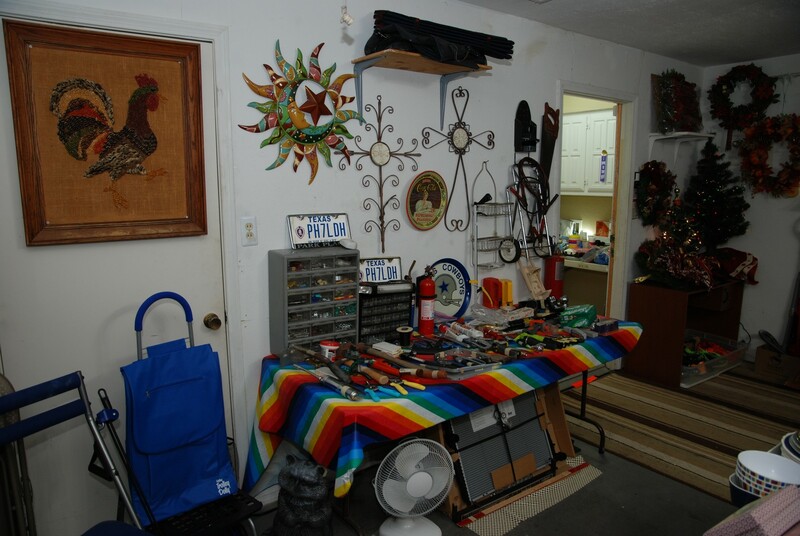 We have a large table of hand tools, some vintage step stools and interesting wall items. 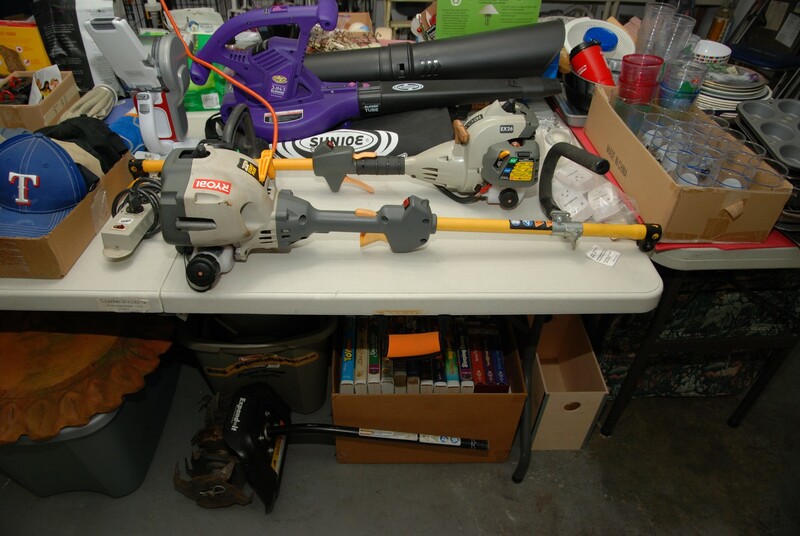 There are two five-shelf storage units, saws, a luggage carrier, and more. 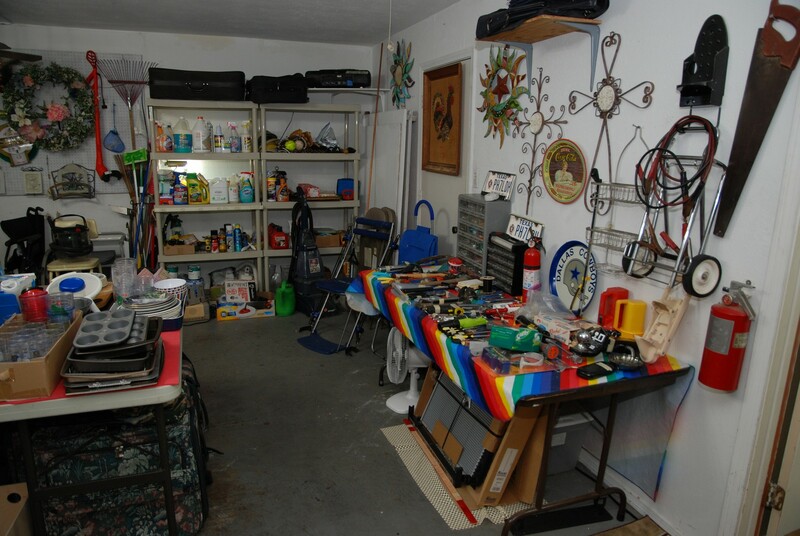 We have men’s athletic shoes, a small desk, and three shelves for Christmas and other holiday items. There is an entire row of nice ceramic pots and plenty of other interesting yard art. 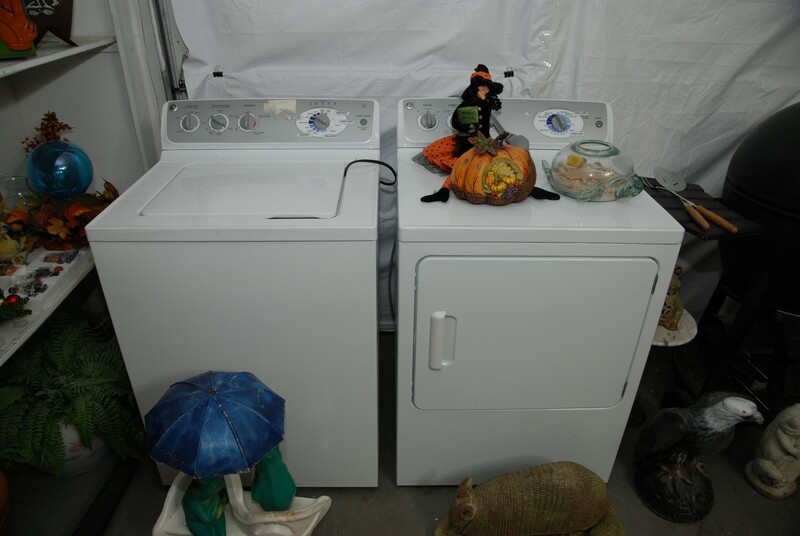 We have a nice General Electric (GE) Washer & Dryer set. Both units are white. 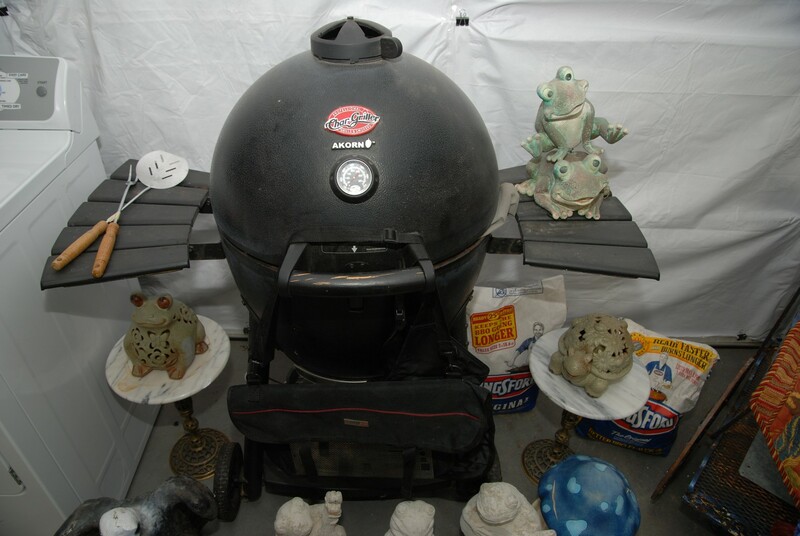 There is a nice Professional Char-Griller (grills and smokes) by Akorn - a really great find. 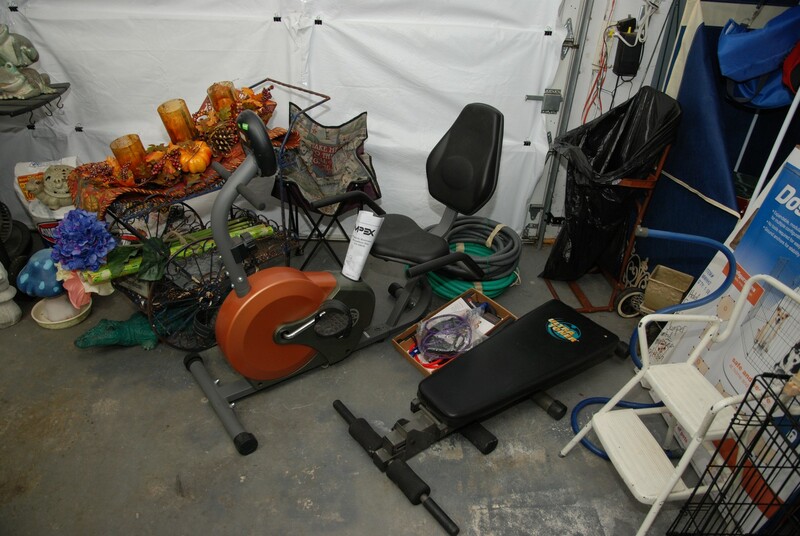 There is some exercise equipment like an Ultra Toner and a Impex by Mercy Exercise bike. We have a nice portable clothing rack. 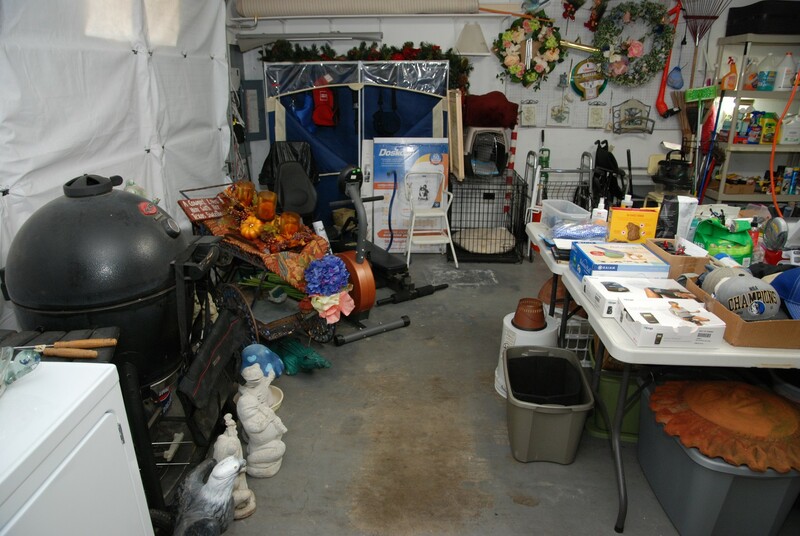 We have assorted items for dogs including: a Doskocil multiple configuration 36” high fence/pen, a dog crate, and a larger wire crate. 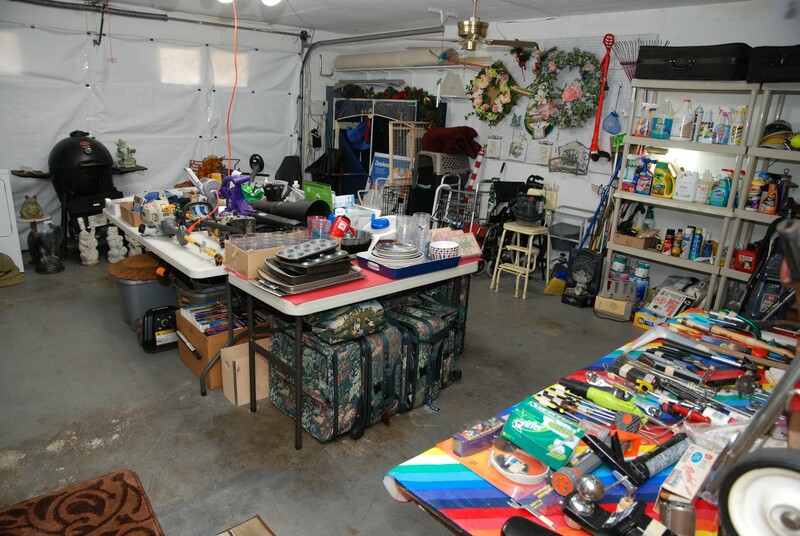 There are other items for animals like lots of dog toys. 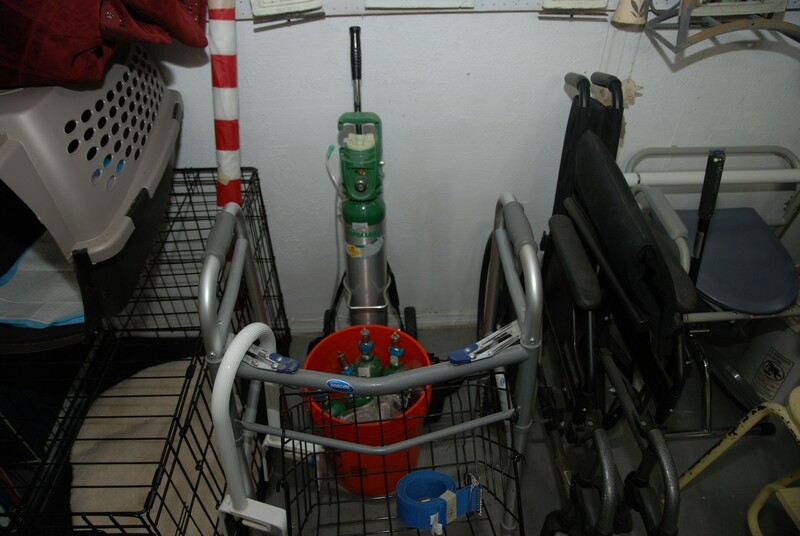 We have a wheelchair, a portable potty chair, a walker, oxygen tanks, and more. 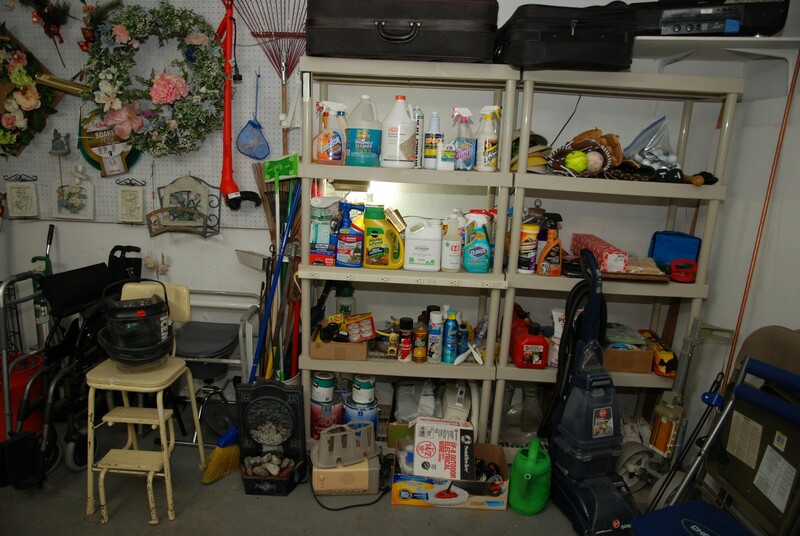 There are quite a few Lawn and Garden chemicals and fertilizers. There are also a lot of VHS tapes. Some are Disney. We have a nice Chair Gym (with 50 different exercises). 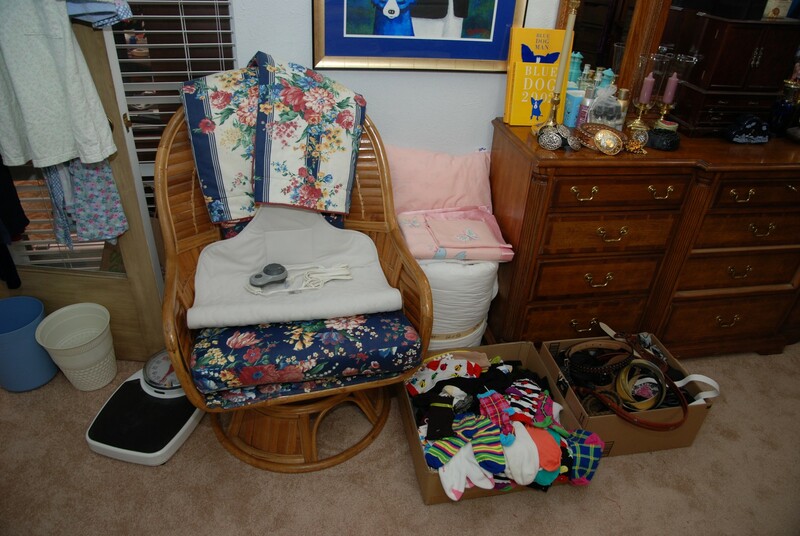 The chair folds for storage. 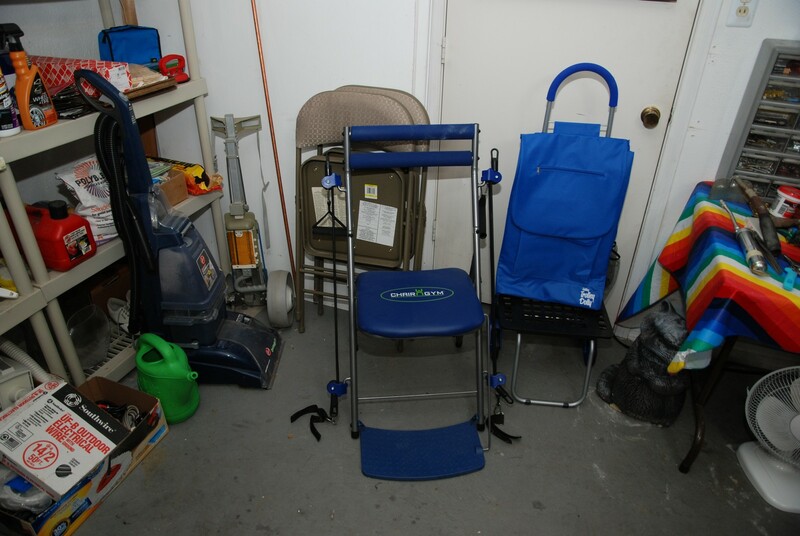 We have a Trolley Dolly – multipurpose blue shopping folding cart with seat. We even have a Hoover double tank carpet cleaner. Come early for the best selection.